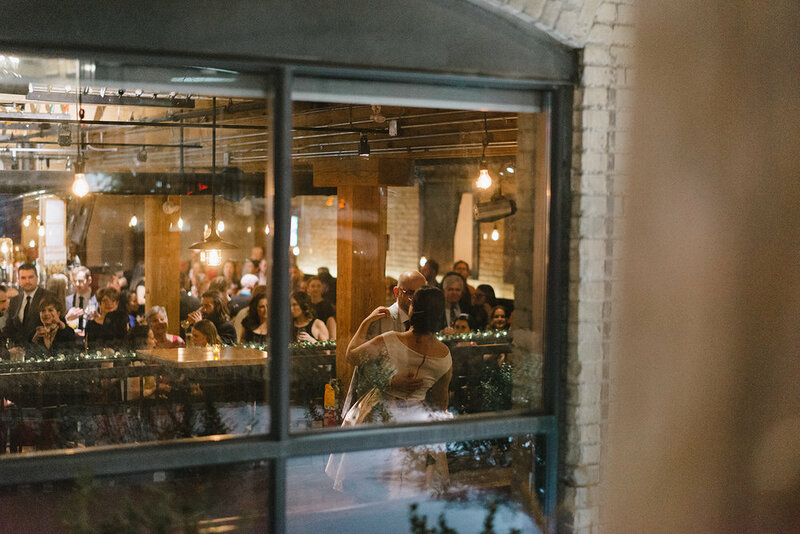 A winter wedding in one of Liberty Village’s best restaurants / bars? Yup. 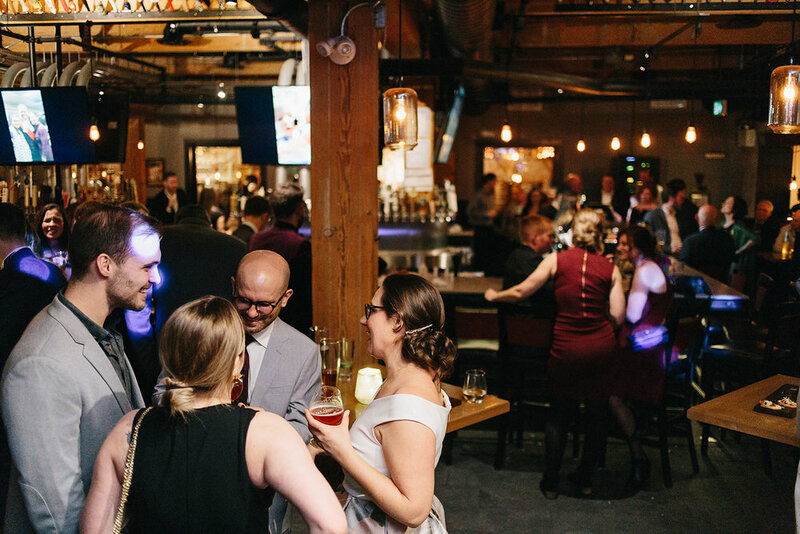 Mike and Amanda’s wedding at the Craft Brasserie & Grille was one of my absolute favourite winter weddings to date. 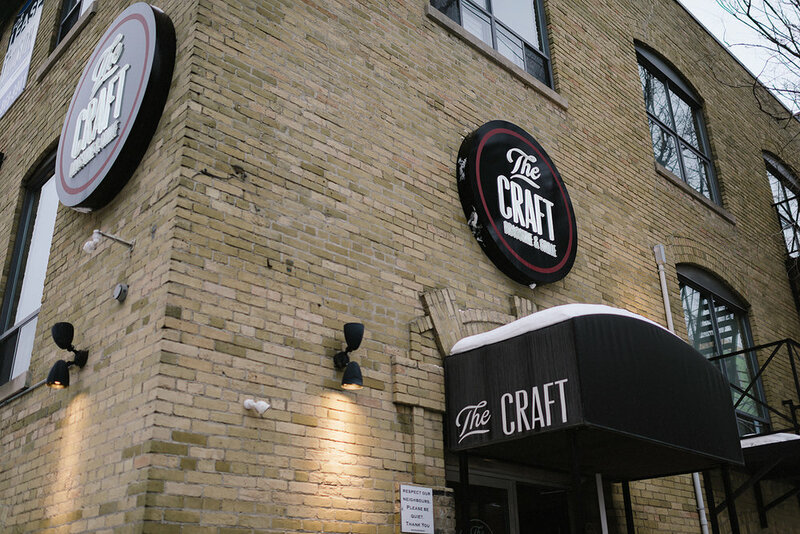 It was very cool to be a part of the first wedding ever hosted at the Craft. 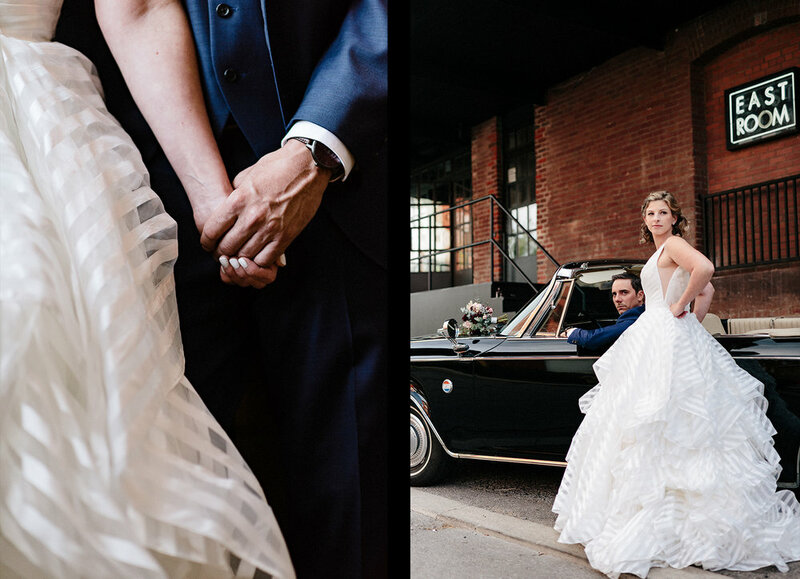 The Toronto neighbourhood of Liberty Village offers so much variety for photographs and wedding options that I was beyond excited to have this wedding on the books so early on in the year. I was fortune enough to cross paths with the bride and groom after I photographed Caitlin and Jon’s wedding (insert link to their blog post, and within a few months of their February wedding in Liberty Village, we met up at the Craft to have a variety of craft beers and check out the space before it was transformed for their winter wedding. 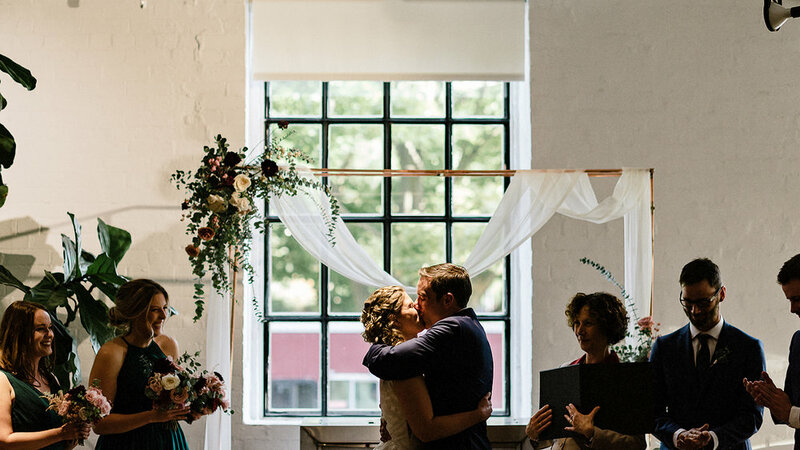 There was so much to love about the entire wedding day, including the weather. 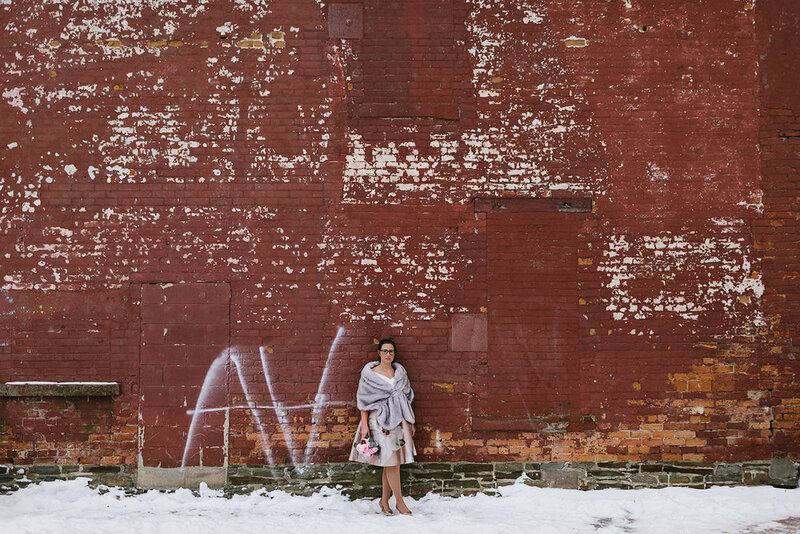 Although we’ve been treated with a cold winter this year, Mike and Amanda got one of their milder days which gave us so much flexibility for the photos. 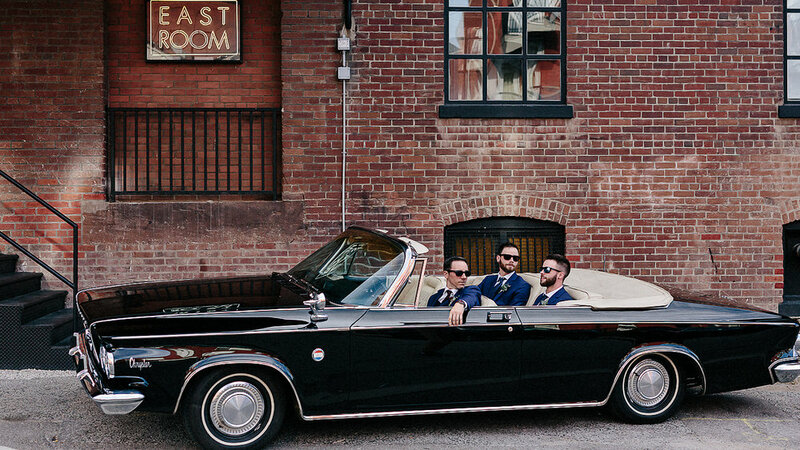 Liberty Village has that old Toronto charm in various alleys and back streets, so naturally we took advantage of the vintage aesthetic for their first look, the bridal party photos and their portraits. 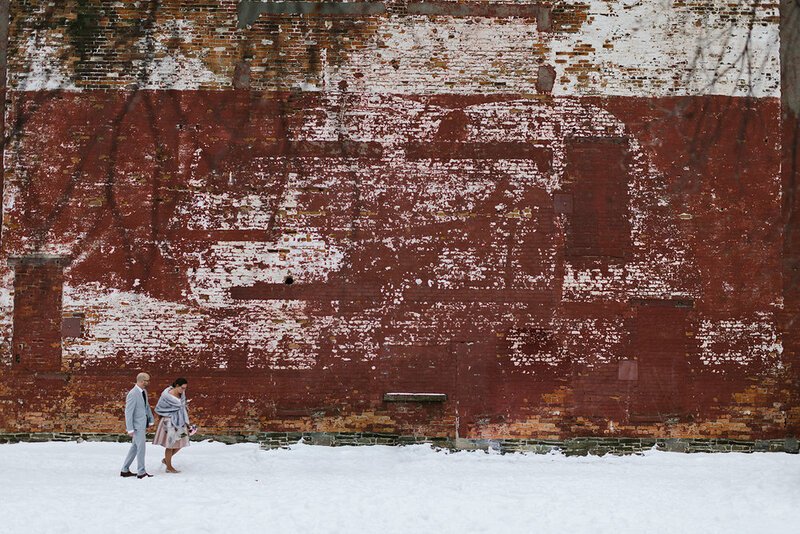 The beautiful red bricks of the old buildings really contrasted with the white and grey that the winter provided. 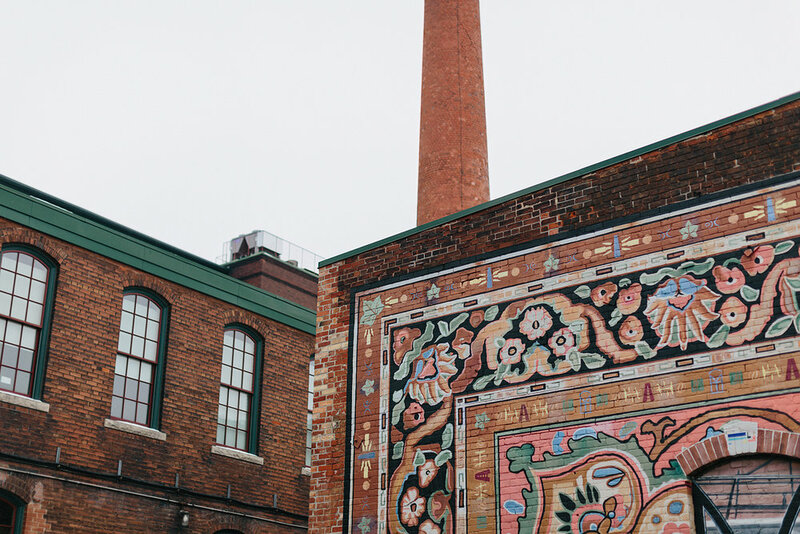 The first look was set in the middle of Liberty Village and it felt like we had the entire area to ourselves and we sort if did. 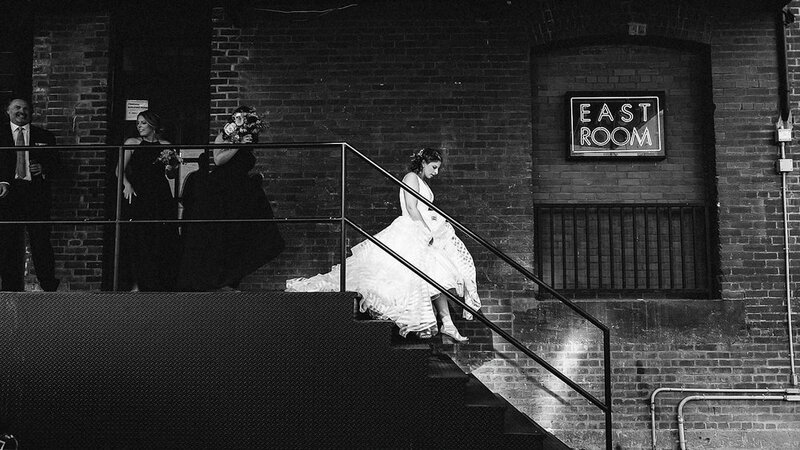 I vividly remember their first look and how excited Amanda was and how she was unable to contain her happiness and curiosity, peeking around the corner to see her soon to be husband standing in the middle of the street. 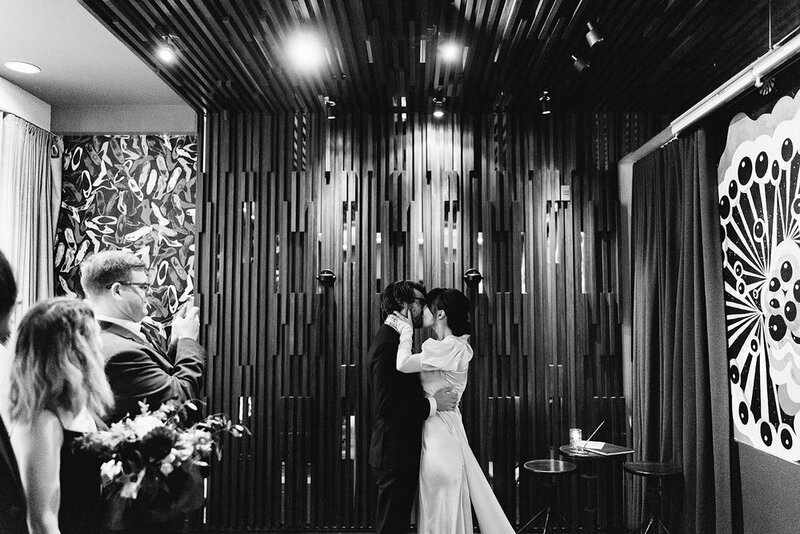 It was a cute, genuine and inspiring moment where their love revealed itself in a subtle form. 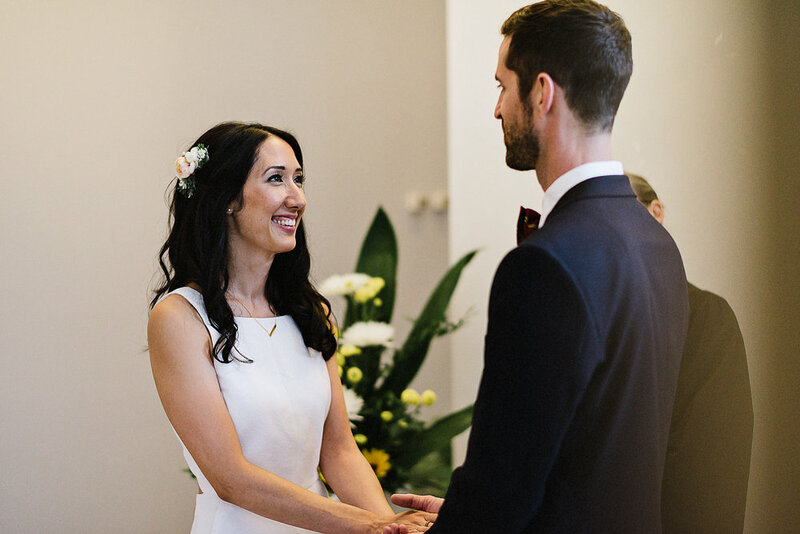 Amanda looked incredible in her minimal and subtle modern bridal look, sheer elegance with a bit of flair thanks to a beautiful shawl. 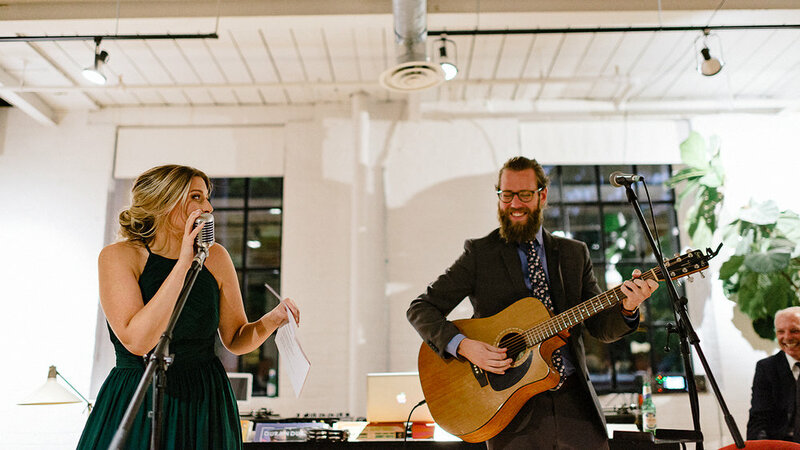 The entire aesthetic and vibe of the wedding was 100% Mike and Amanda : low-key fun with a bit of quirkiness. 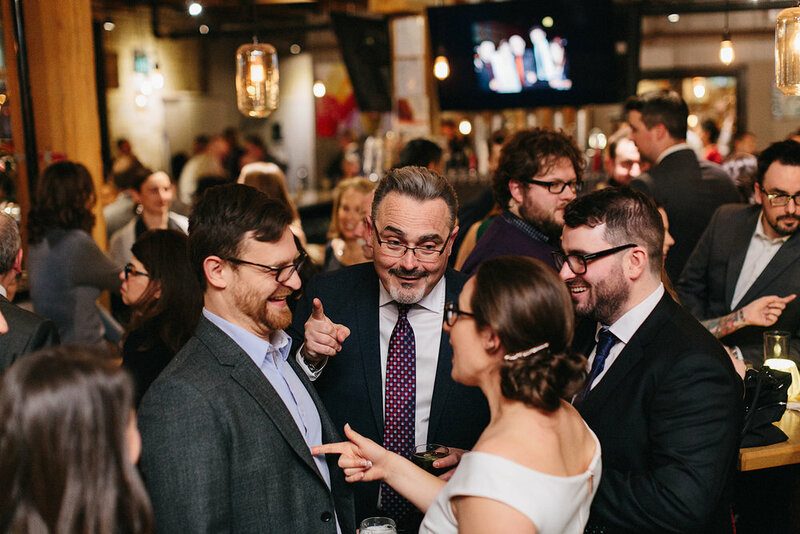 I mean, if you’re getting married in a restaurant that serves with 120 craft beers on tap, you probably appreciate good times in a good atmosphere with your closest friends and family, and that’s exactly what this wedding was. 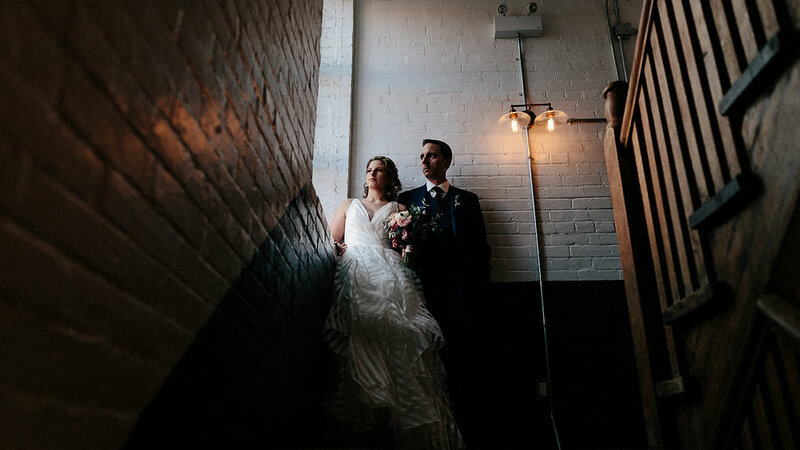 Of course, we took advantage of the beautiful space and MASSIVE keg room for some unique and off-the-cuff portraits, I actually think it was colder in the keg fridge than it was outside, but the bride and groom didn’t flinch, probably thanks to a few of those craft beers keeping the blood warm. 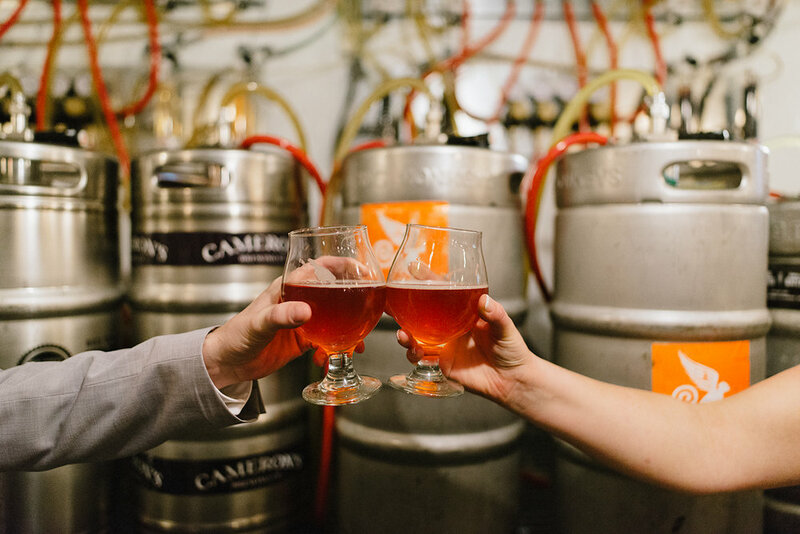 I never expected to get a romantic vibe from a keg room / beer fridge, but Mike and Amanda took the time to get away from their friends and family to enjoy a second together, alone, and take in the quiet moment as they the feelings of their entire wedding day washed over them. 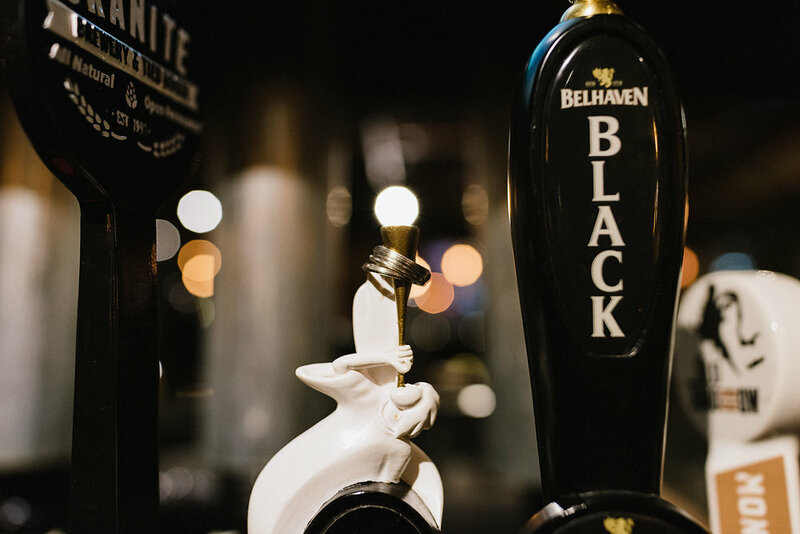 With the sun setting early, the mood quickly turned to a lively vibe where guests were mingling, dancing, and tasting all 120 craft beers available to them as they chowed down on some incredible BBQ dinner. 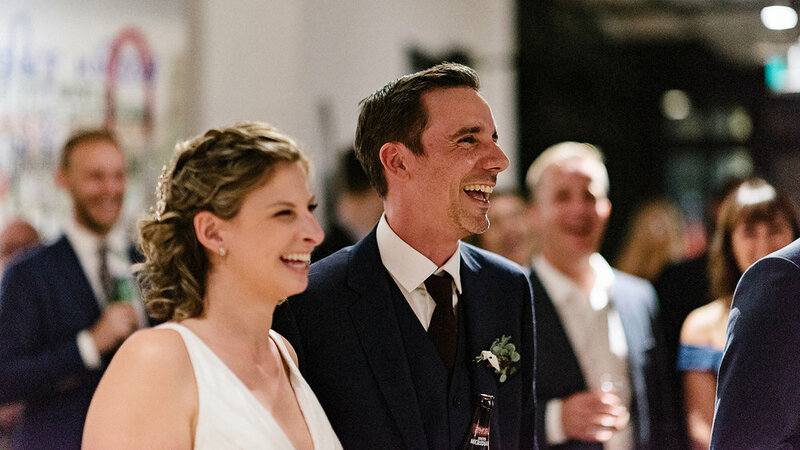 The night was filled was laughs, and no bigger laugh came then the moment the bride attempted to pour a pint of beer for herself and her groom, only to quickly fill the glass with head and spilling the excess beer on her wedding dress! It was a hilarious moment that I’m sure none of us will forget. 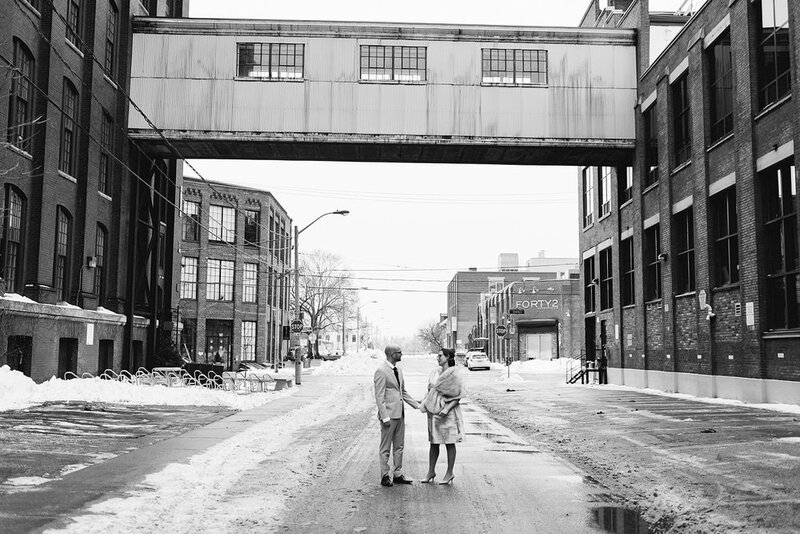 It was a beautiful day, and although I hate the cold, it was without a doubt worth standing outside to witness the natural and candid moments unfold between these two incredibly genuine people on their wedding day. 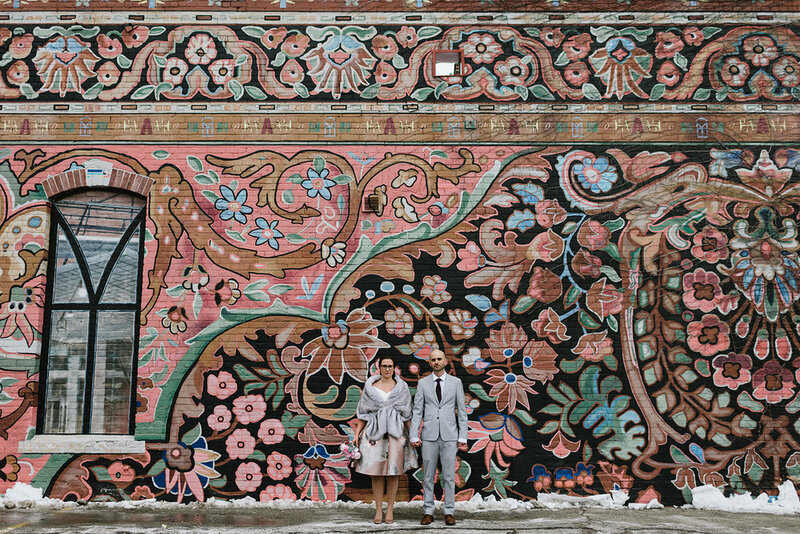 A winter wedding in Liberty Village Toronto, done right. 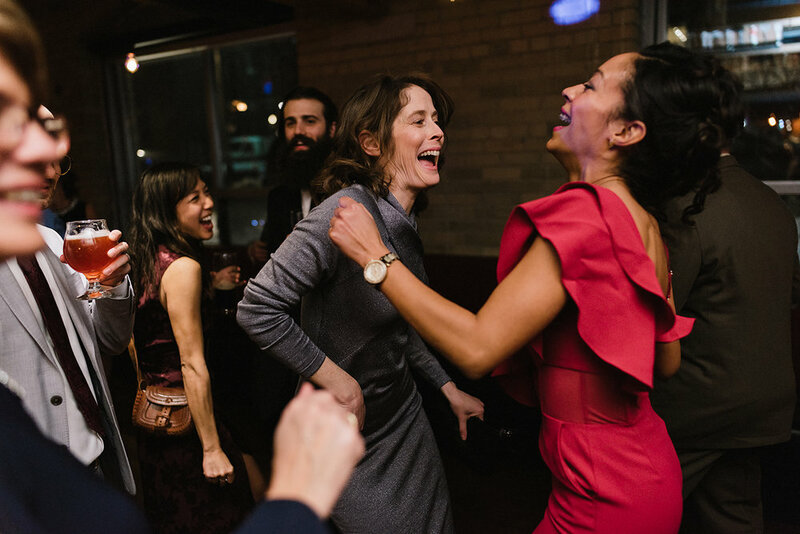 The 2019 wedding season kicked off with some familiar faces in a familiar place, the Broadview Hotel, in the heart of my former neighbourhood of Riverside, Toronto’s not so hidden gem anymore in the East end of downtown which played host to Seana and Bryce’s winter wedding. 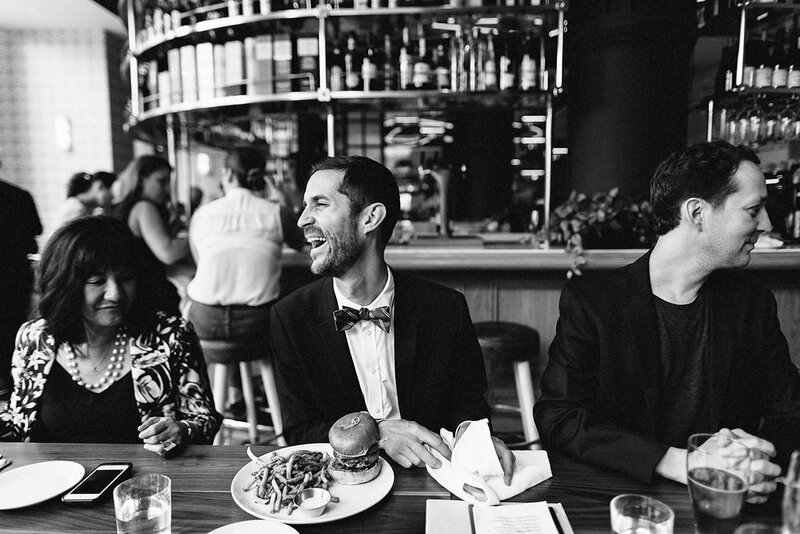 I met both Seana and Bryce a few years ago when I photographed her sister Danielle’s wedding at Boehmer restaurant. 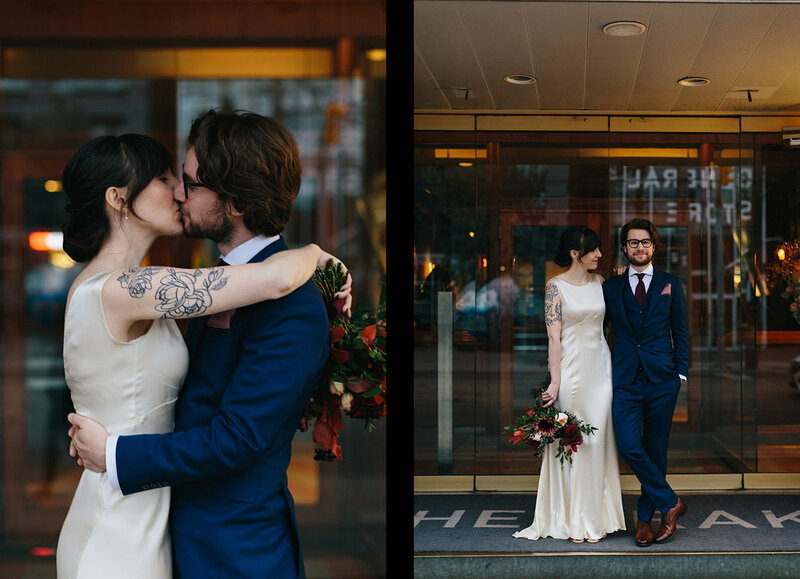 At the time we joked that if I did a good enough job that sometime in the near future I’d likely get to be photograph Seana’s wedding, and here we are, a few years later at the Broadview Hotel fulfilling the prophesy. 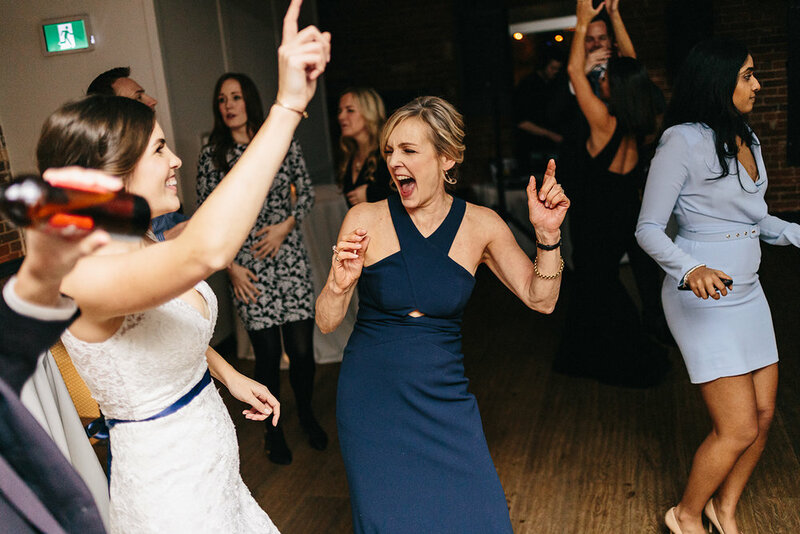 After my first experience wit their families I knew wholeheartedly that this wedding was going beyond enjoyable and relaxing. 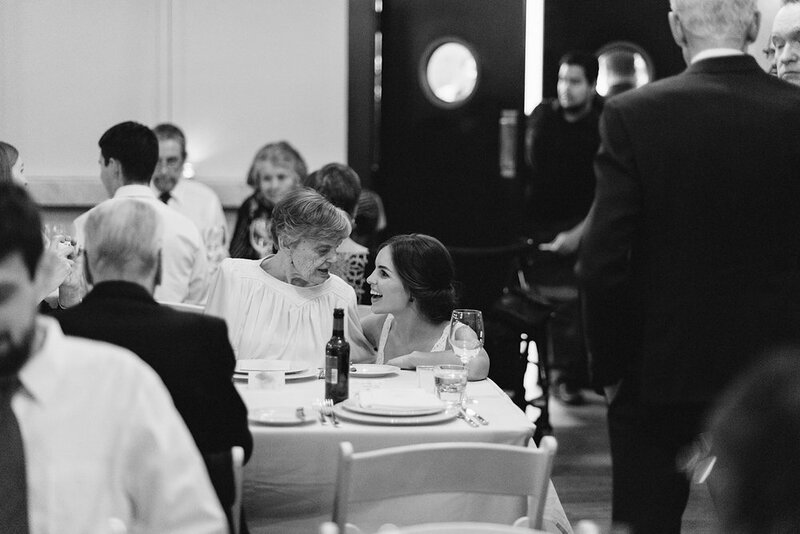 It’s also cool for me to get the insight on family traditions and habits including Seana’s grandmother wearing her vintage dress that she wore to her own daughter’s wedding and Danielle’s wedding a few years ago, was a moment I was personally looking forward to. 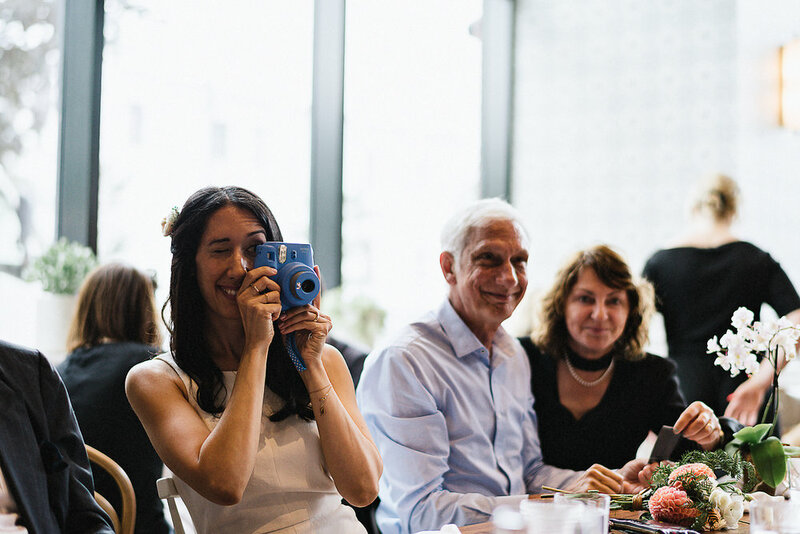 I was also excited to potentially unconsciously capture re-created moments like the bride’s grandfather taking a portrait of her much like he did years ago with his other granddaughter. 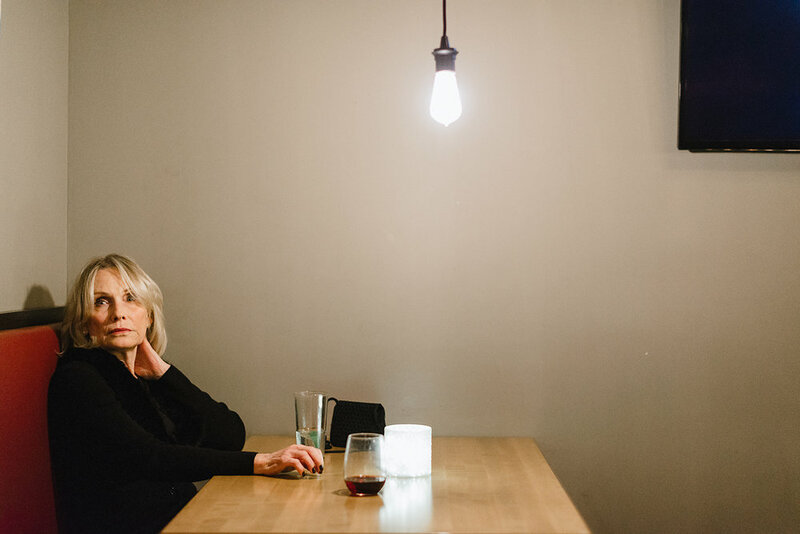 In all facets of my work, I’m always habitually drawn to photographs that I’ve taken of familiar people, I’m given an unconstrained perspective of who people really are at times which gives me a personal feeling of nostalgia that can’t quite be explained but somehow comes through when looking at the images. 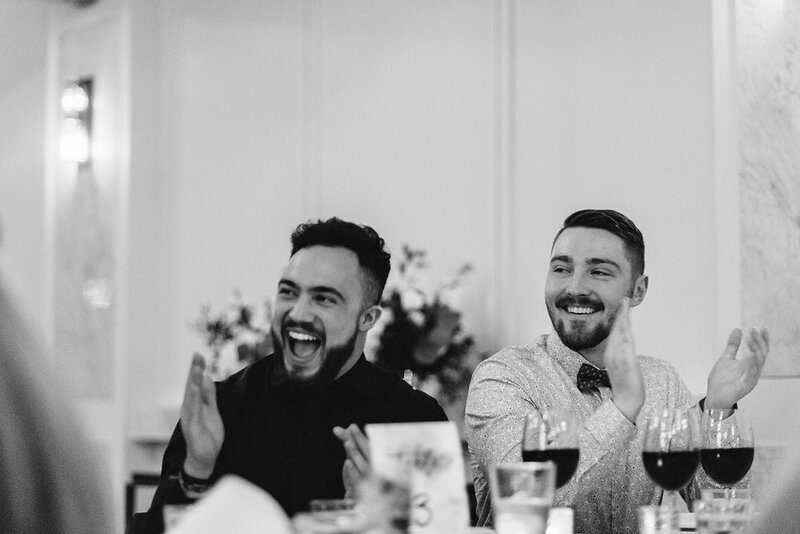 A unique and rare opportunity as a wedding photographer, so I wanted to make the most of it as much as I possibly could. 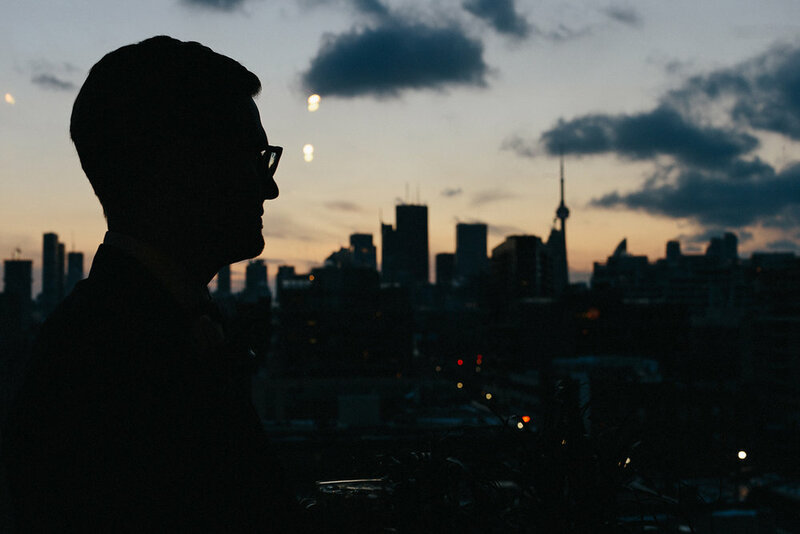 Winter weddings are somewhat rare here in Toronto, but anytime I get the privilege to capture one, I often wonder why they aren’t more popular. 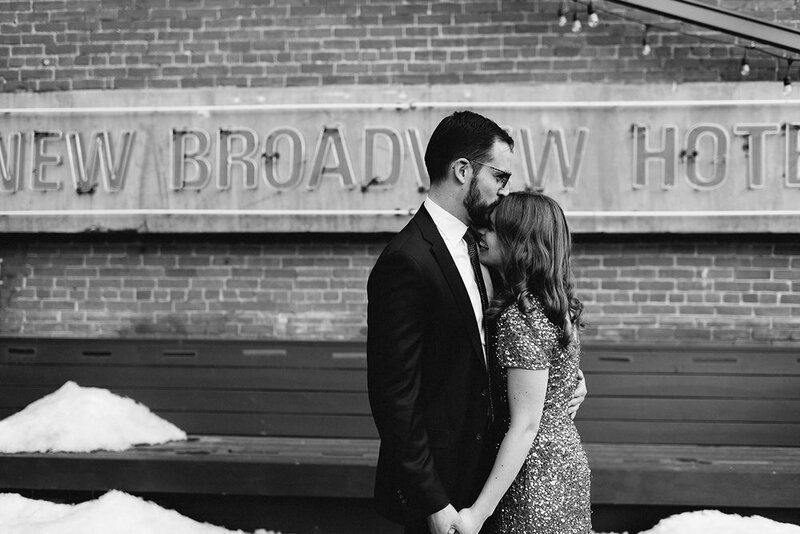 The Broadview Hotel was the perfect place for their winter wedding as a matter of fact. 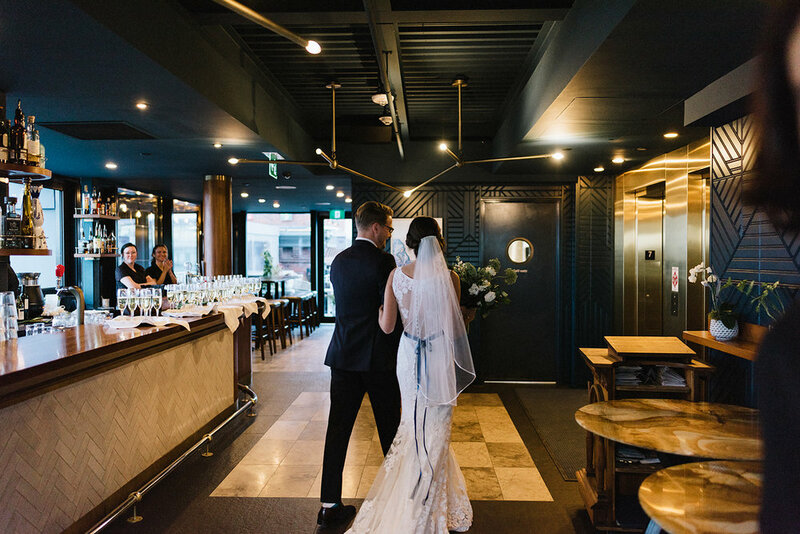 The rustic and modern interior of the hotel provided limitless opportunities for us to capture artistic images, the glass rooftop made for a romantic setting for the first look and portraits. 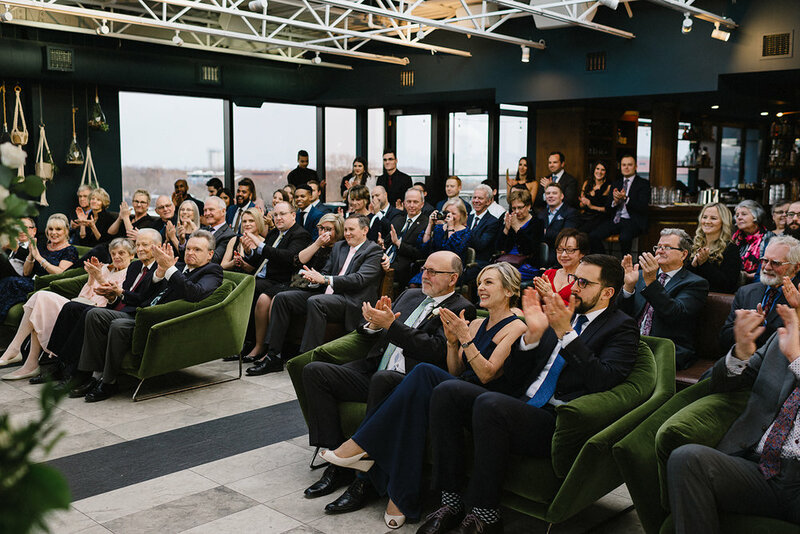 The ceremony was also held on the glass rooftop, and being treated with a sunny winter day, the entire ceremony space was filled with pale light through all the windows as the sun began to slowly set. 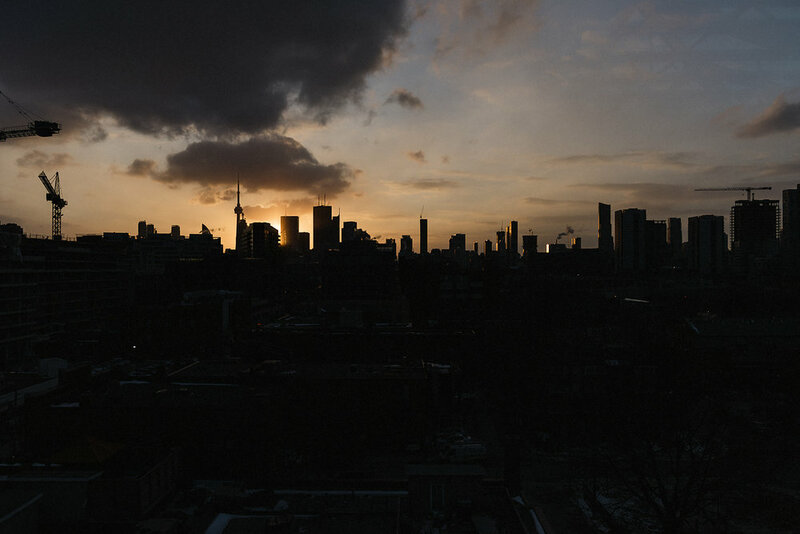 The entire ambiance of the day was vivid and an homage to people who appreciate a retro-modern industrial vibe that truly represents the current feeling of living in Toronto. 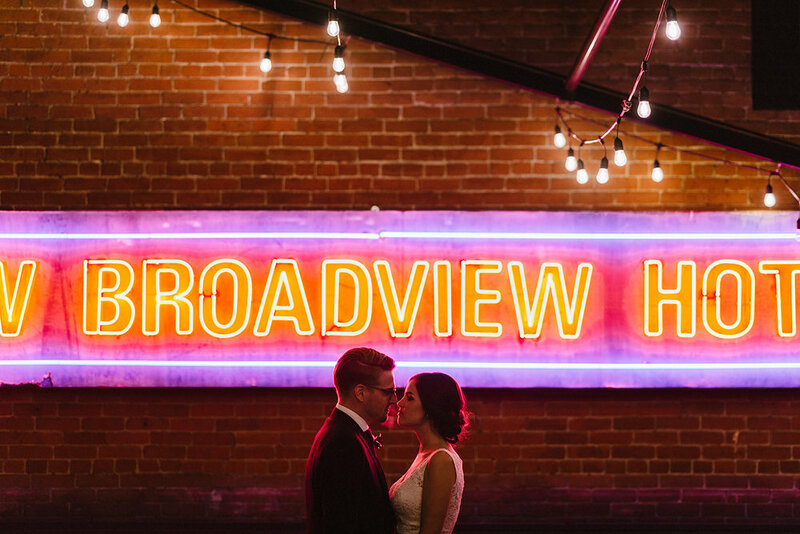 Of course, the neon Broadview Hotel made an appearance at the end of the evening, providing the vintage aesthetic to bring the entire day together as the bride and groom enjoyed a moment alone to appreciate the ephemeral nature of their thoughts, emotions and the entire day leading up to that point. 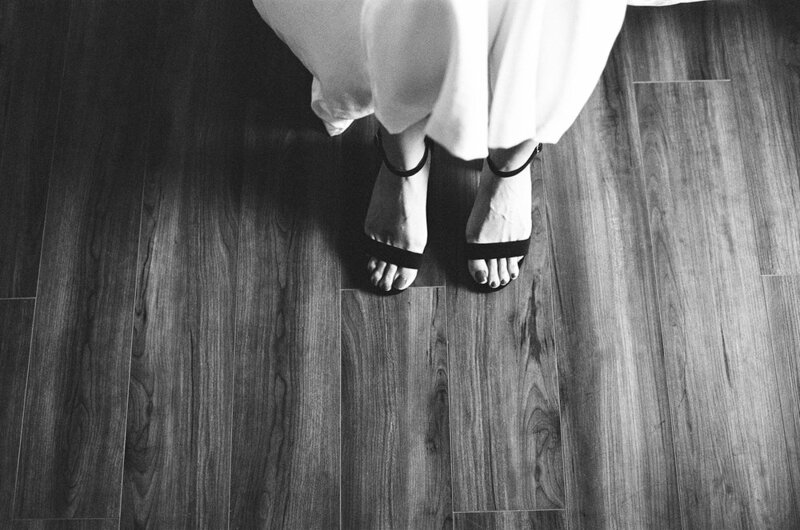 I wanted to represent this feeling as much as possible, the help of analog film played a huge role on this day for that very purpose. Shooting rolls of Super 8mm film to accompany some 35mm film helped me capture a tangible feeling that could only be truly experienced in the present moment otherwise. I grew up watching Super 8 footage of my family and always remember getting extremely sentimental watching the films, no matter how old I was or how many times I’ve re-watched the same reels, I was always brought back to a moment and place in time that would be otherwise fleeting, I could still somehow live in that moment over and over again through those sentimental emotions. 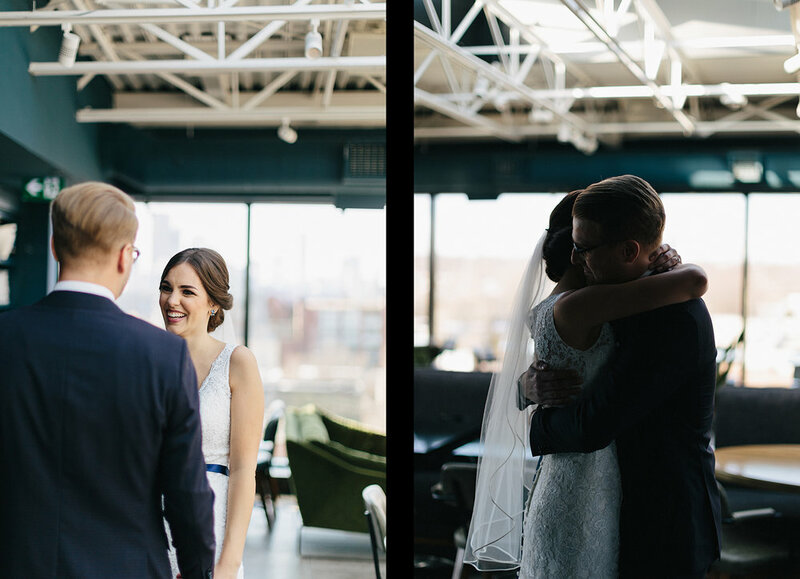 I wanted to do my very best to give Seana and Bryce the opportunity to look back on their beautiful wedding day and feel that way about their memories. 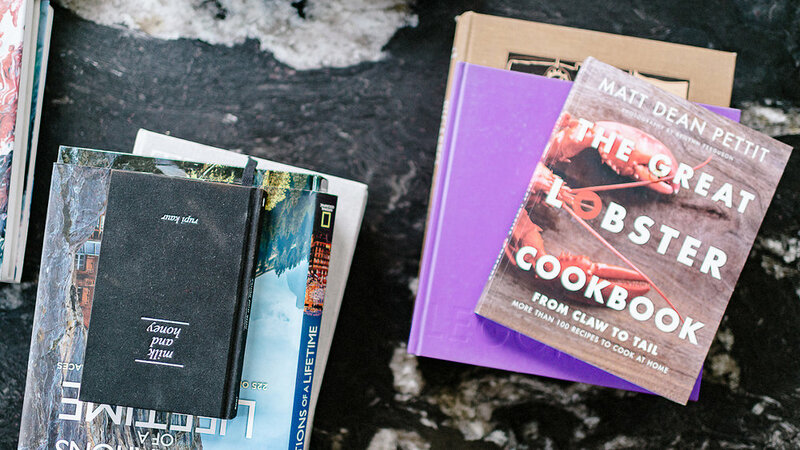 We’ll always somewhat forget the mundane details, but we rarely forget how we felt. If you’d like to feel a bit of that nostalgia, the Super 8mm highlight clip is at the end of this blog post. Once in a while I cross paths with people who truly understand me and the intention behind the work I create. 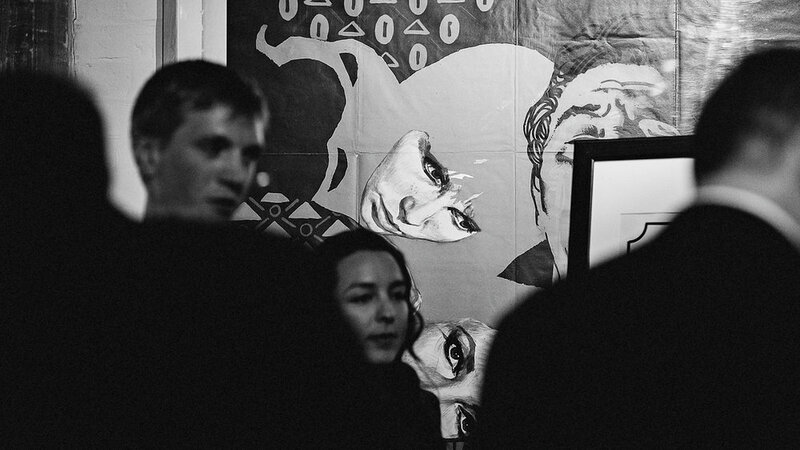 I find it often difficult to articulate a lot of what’s going on in my mind and heart when I’m taking photographs. 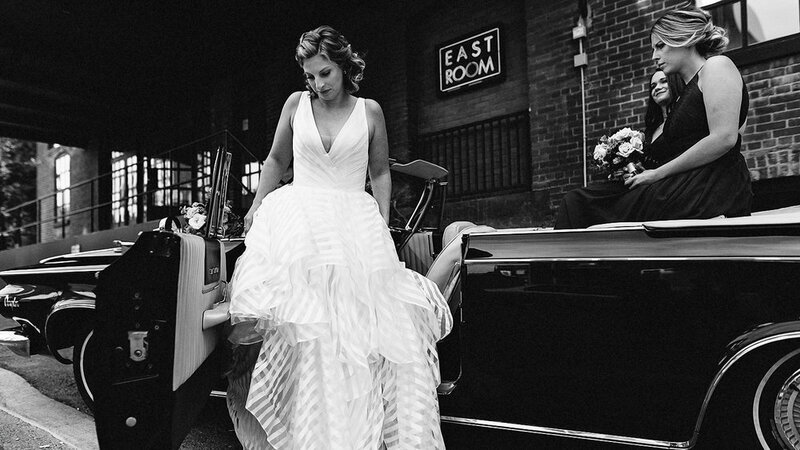 Wedding photography had put me in a weird place and I was at a crossroads, writing an elegy in my mind when I had initially met Karl & Emeiko at the Wedding Co. Market the year of their wedding. 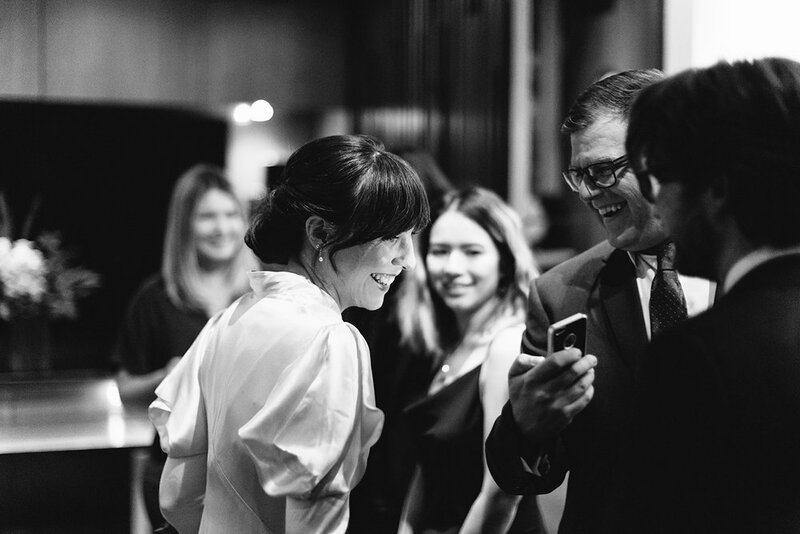 We probably spoke for a solid hour at the event, going through albums, discussing various facts about ourselves which led to Emeiko explaining her father’s career as a photographer and how analog photography “just made sense” for her wedding. 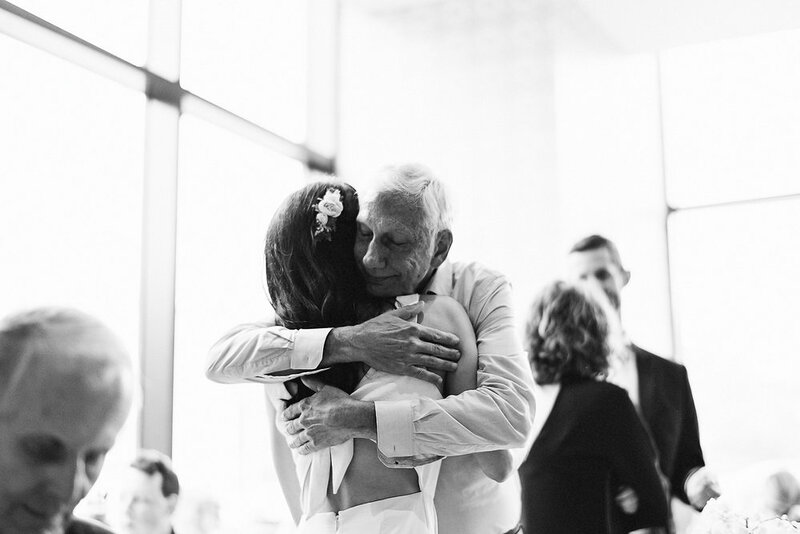 After seeing her father’s work, I felt the pressure, but I was so excited to be using analog film to tell their story all the while paying homage to an important element of her relationship with her father. 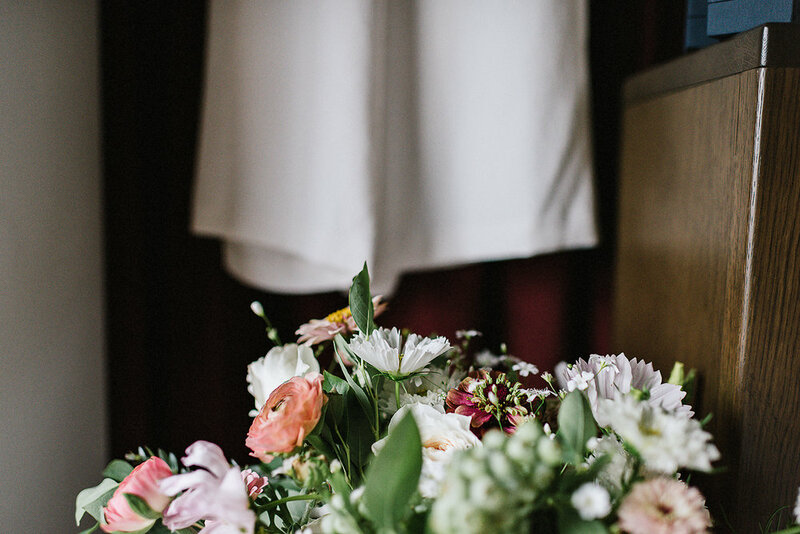 It’s something I can deeply relate to and made me feel sentimental and nostalgic throughout their wedding day, and those are two feelings I often try to hone in my own personal work so to have it carry over to a wedding was special to me. 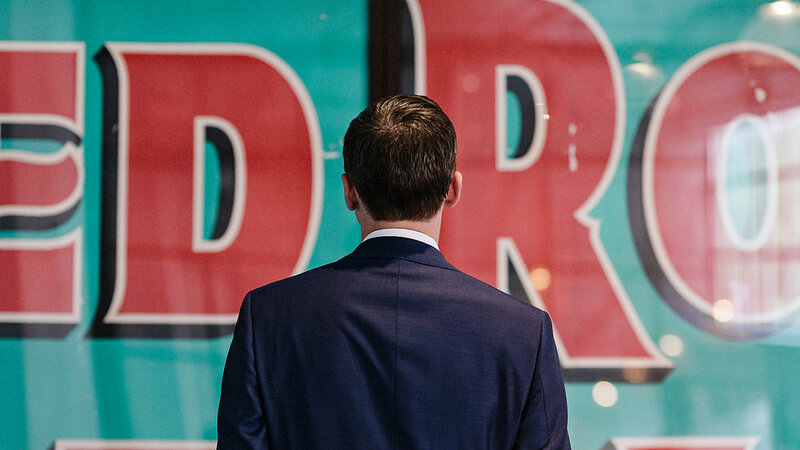 I always find these little things about people that I like to dig into as a photographer to help elevate my ability to photograph someone’s true self. I can’t entirely say for certain, but there was something about these two that made me feel at ease. Maybe it’s because Emeiko reminds me so much of my older sister, and maybe it’s because Karl has that French-Canadian charm I was became so accustomed to back in Ottawa throughout my childhood and teens while attending French school. I can’t say for certain what it was that drew me in, but it was sincere. Leading up to the wedding I got to hangout with them at Toronto Island, where we walked the flooded Island that we had to ourselves and took the late night ferry back to the city as we came down from a midnight wish, staring at the clouds as we felt the wind at our backs. 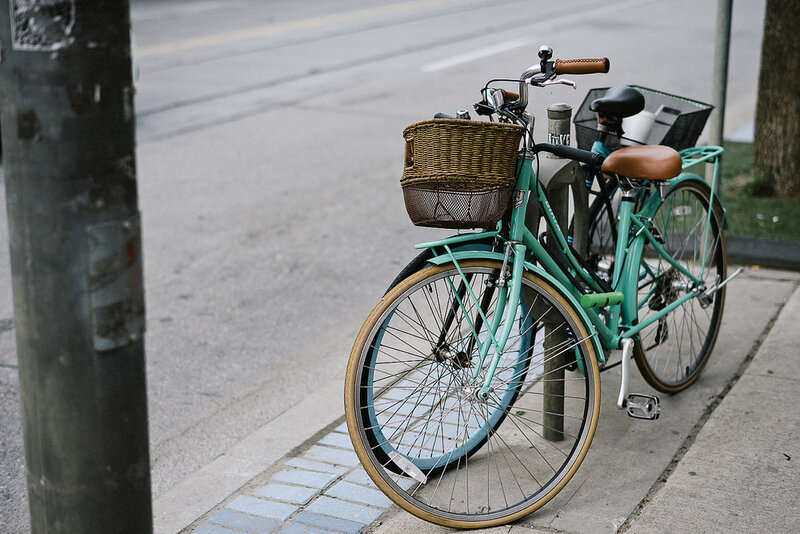 It was one of those hyper-real experiences that you only share with people close to you and people who have no hesitation of letting go and living in a moment within your presence. 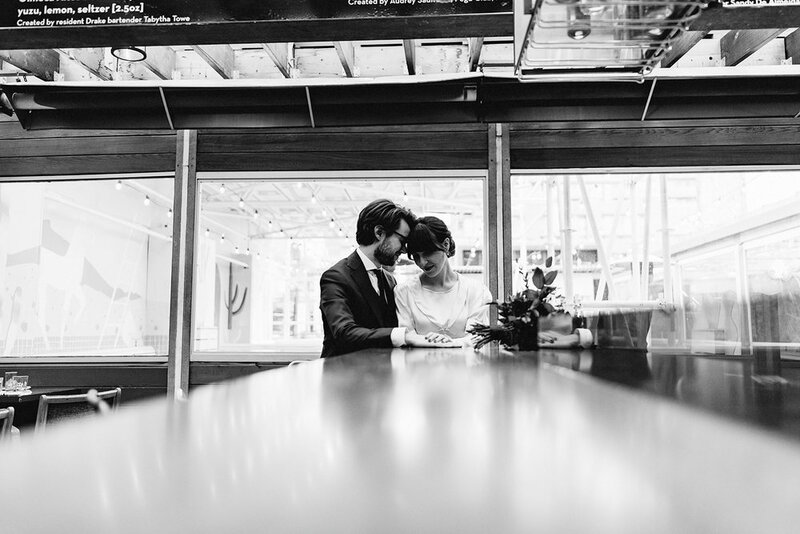 Having gone through that I had high hopes for Karl & Emeiko’s two part wedding day that they had set out, with part 1 setting the stage with their Toronto City Hall elopement in the morning. 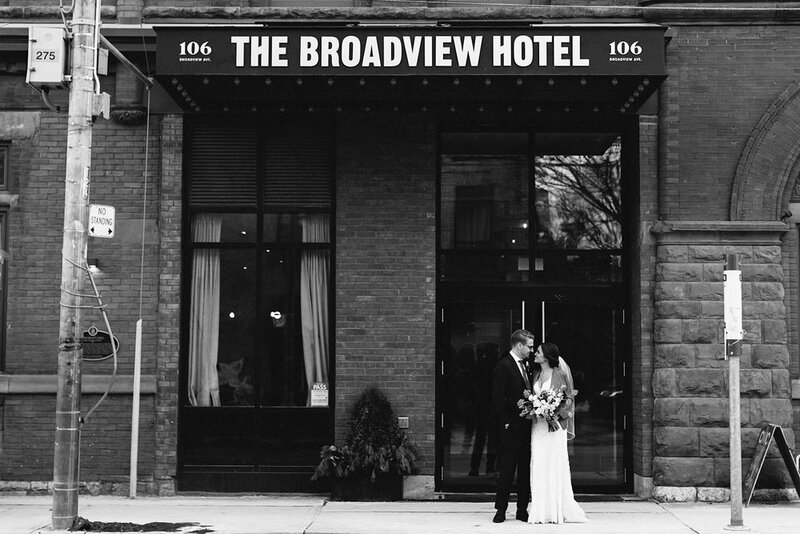 With the Broadview Hotel playing host to both their getting ready’s and their first look. 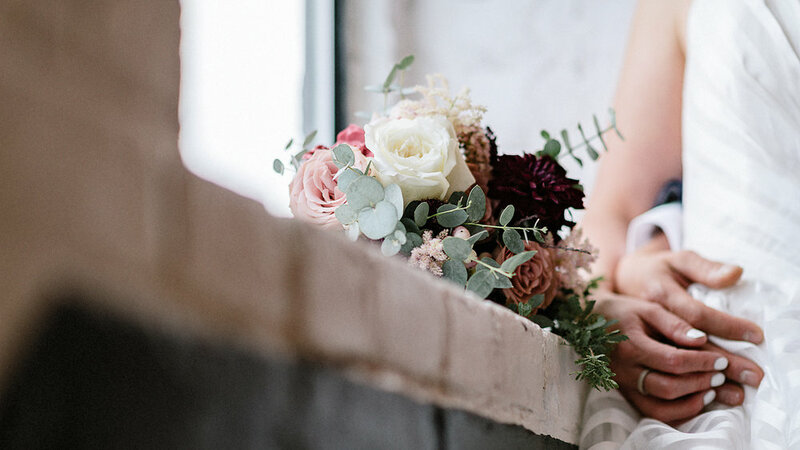 They played the first part of the day as casually as you can think, starting off bright and early with the groom making a pit stop at the flower shop to pick up his soon-to-be bride’s first bouquet of the day. 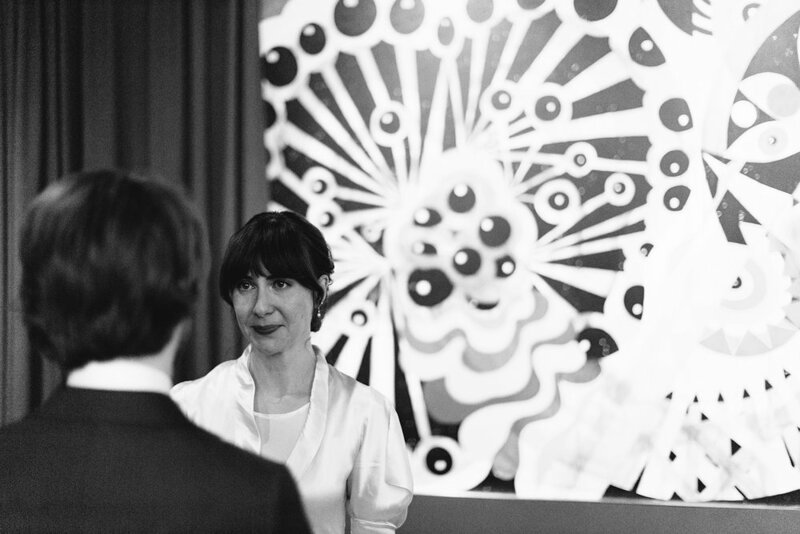 The bride and groom decided to get ready together for the first part of the day providing candid moments like Emeiko helping Karl with his tie only to have him return the favour in helping her put the final touches on her white jumpsuit. 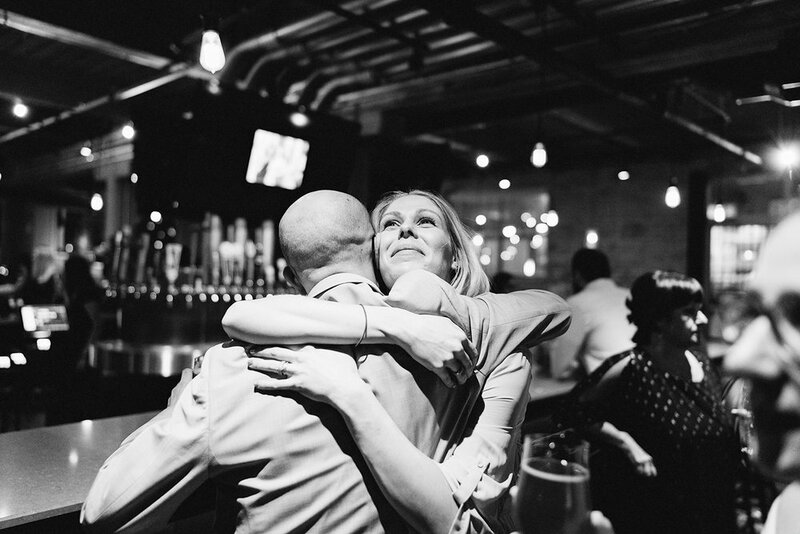 It was both beautiful and intimate to see them both nervously anticipate what was to come, yet being able to comfort each other through laughter and kind gestures along the way. 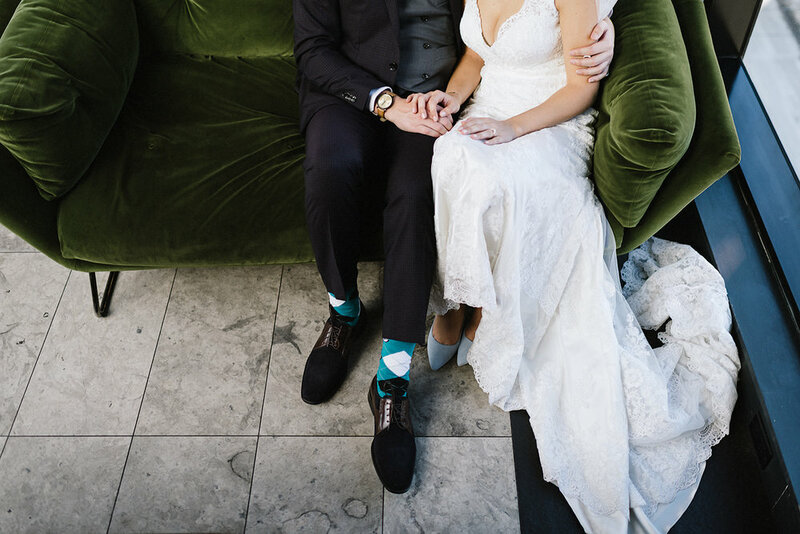 I’m glad they saved their first look for the second ceremony since I got a unique experience and insight into their relationship and the transition from two people in love, to two people bonded by commitment. 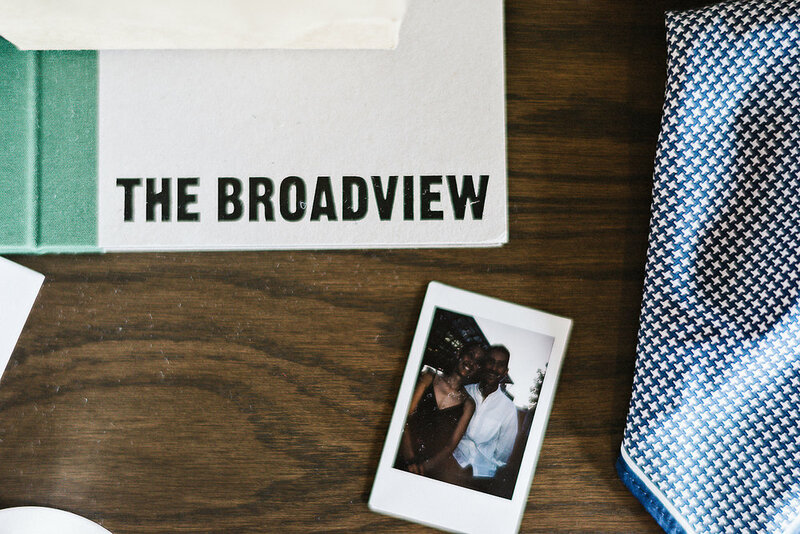 The Broadview hotel provided a great atmosphere with quirks and sophistication. 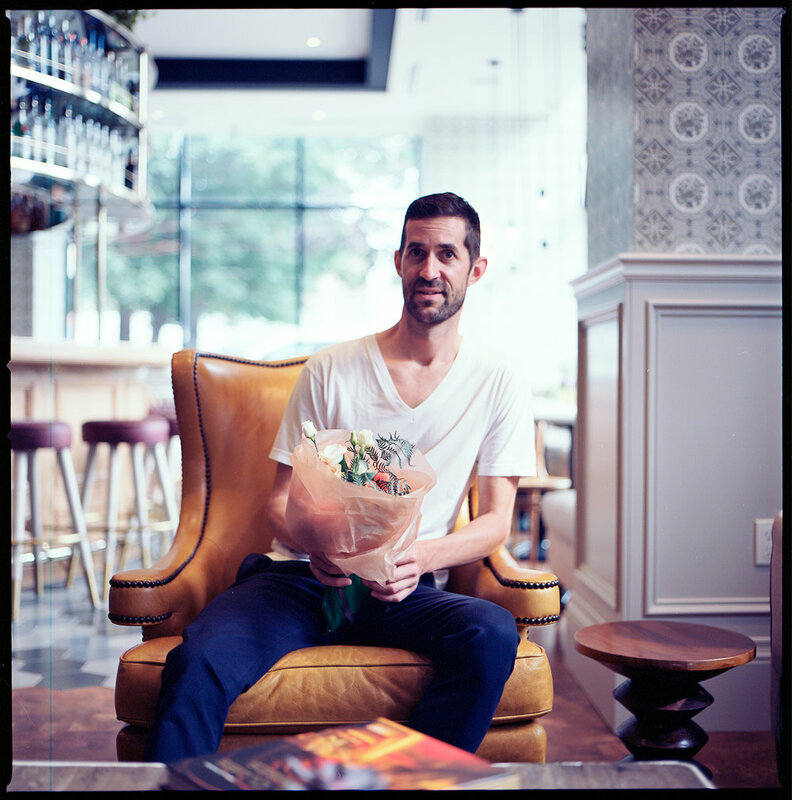 A vinyl record player in the room adding to the ambiance and allowing Karl and his mom to bond over Tycho’s album “Hours” and discussing how to pronounce the band’s name - we settle of “ ’pti chaud” (small-hot translated from French to English). Emeiko looked stunning. A walking editorial ad. 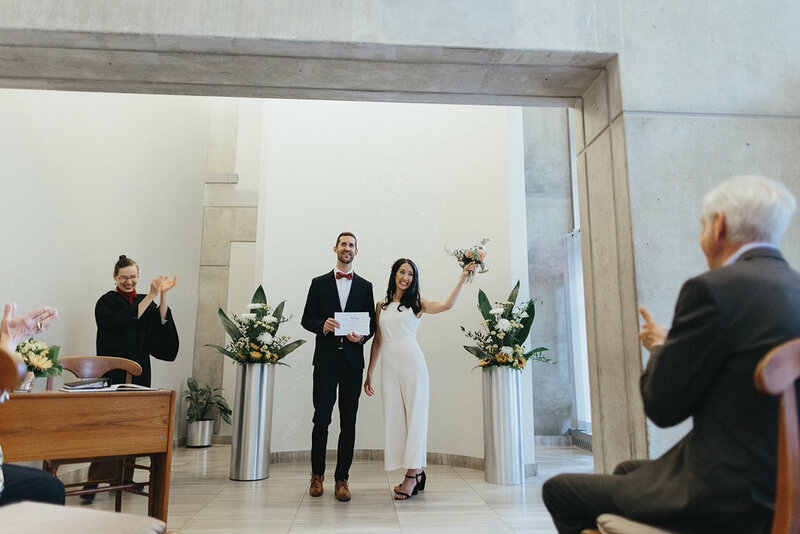 A bride that jumped right out of the pages of Aritzia’s lookbook, with utter confidence and stunning beauty making the white jumpsuit seem like the natural choice for any modern bride getting eloped in the city. 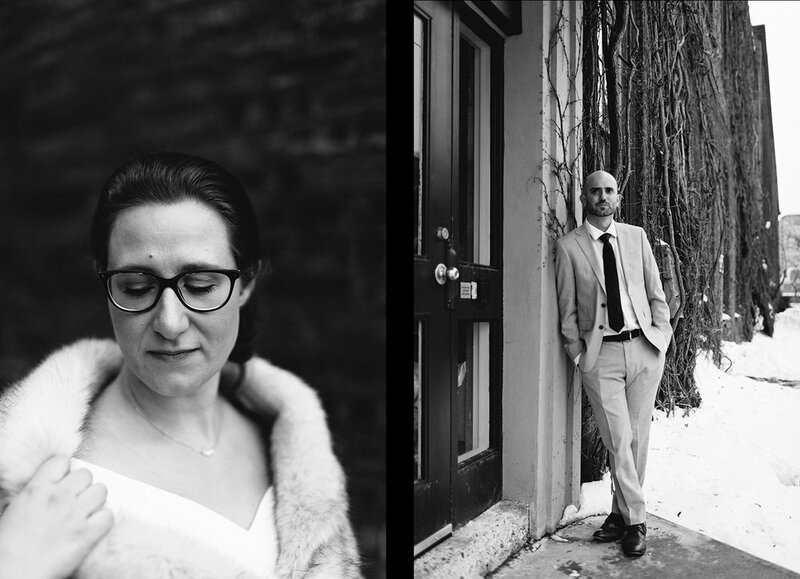 After snapping some shots on 35mm film and 120 medium format film around the hotel - we jetted off to Toronto’s City Hall for their elopement in the presence of their immediate family… and us. 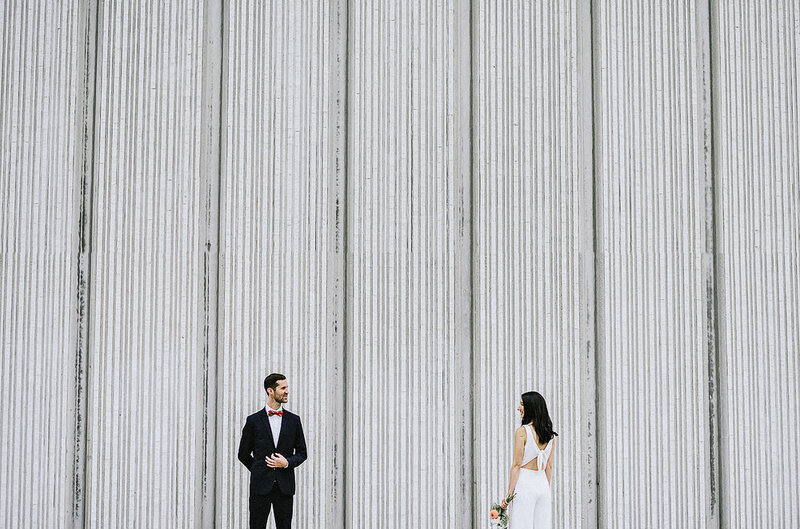 An intimate elopement if I’ve ever seen one. 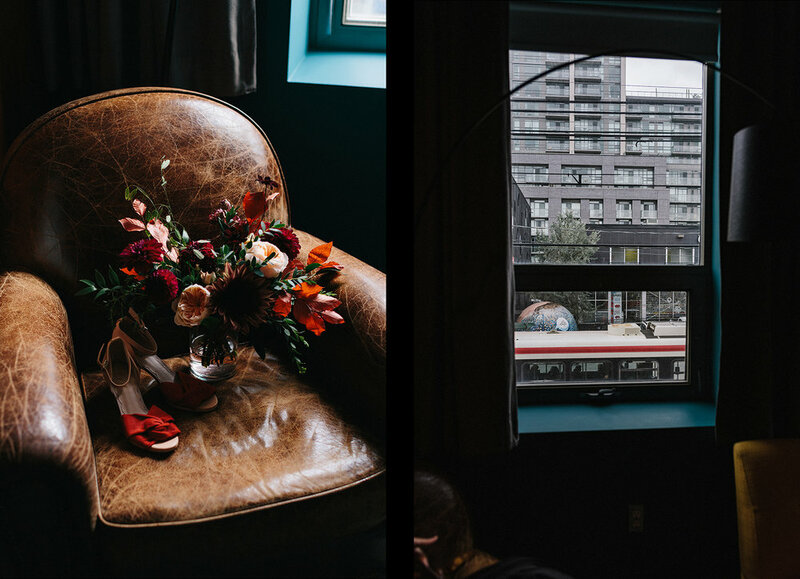 Part 1 of the day was capped off with lunch at the Broadview Hotel’s retro bar - where the bride and groom indulged in some fantastic burgers and good conversation. 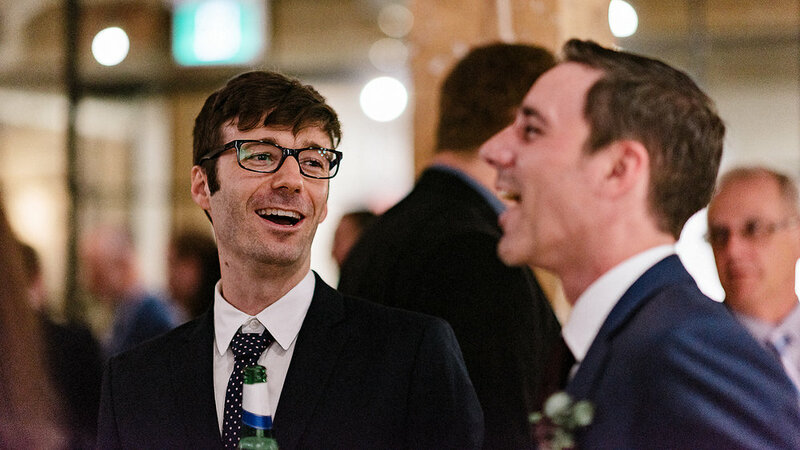 There’s a lot more I can say about this day, and these two, but maybe I’ll save that for part 2. If you think part 1 was good, part 2 is without a doubt worth waiting for. 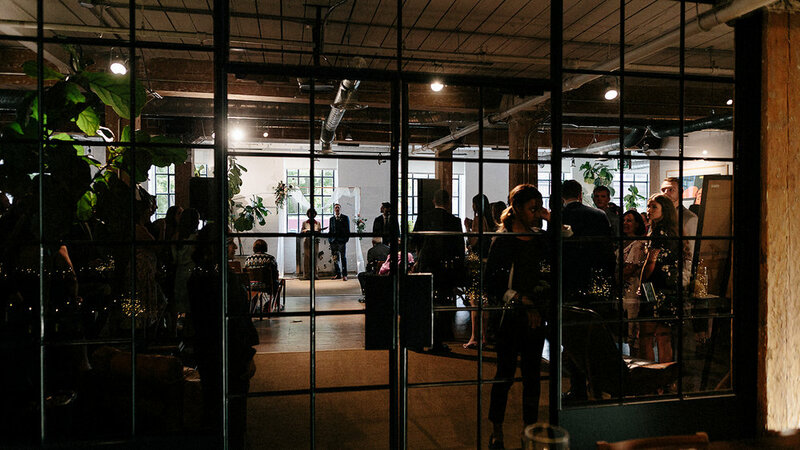 There’s fewer better ways to end my 2018 wedding season than with a pop-up wedding at the Drake Hotel in Queen St. West. 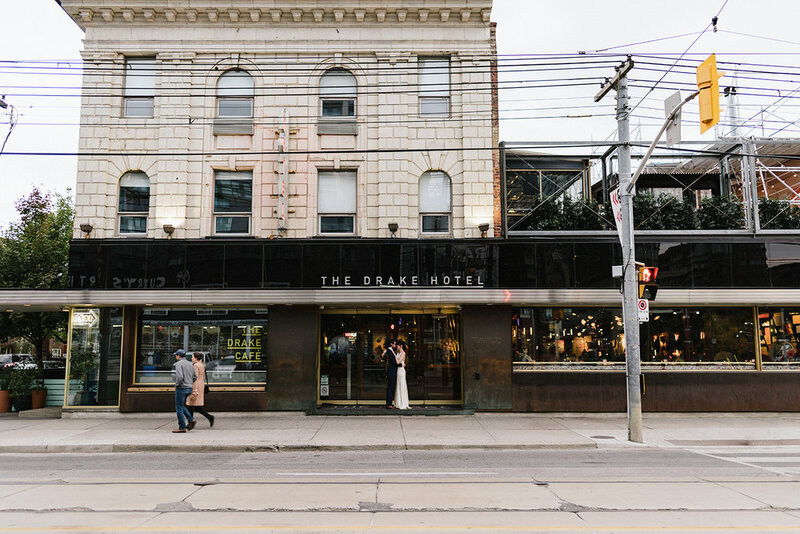 I’m lucky enough to be part of this “one-stop-shop” that the Drake Hotel has for couples looking for a no-hassle, low-key elopement. 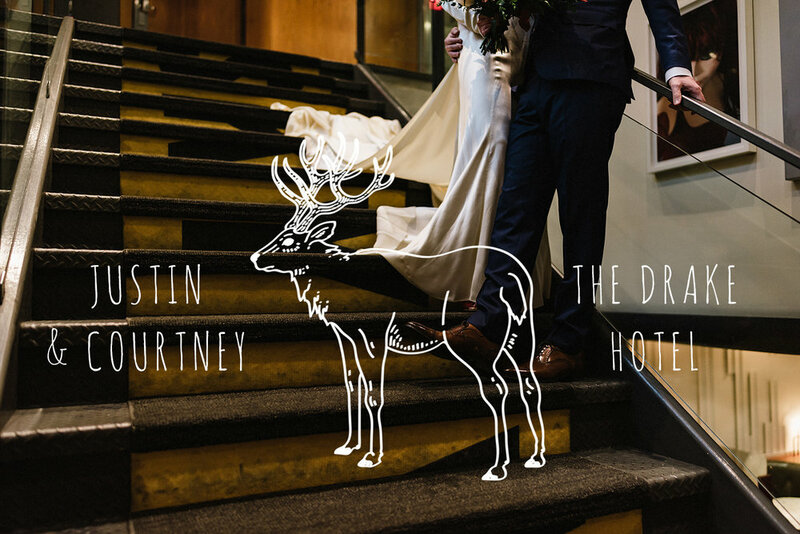 A collaboration between some of the Drake Hotel’s favourite like-minded vendors, Courtney & Justin opted to take advantage of the Drake’s Hotel pop-up elopement option and instead focus on the most important element of the wedding, each other. 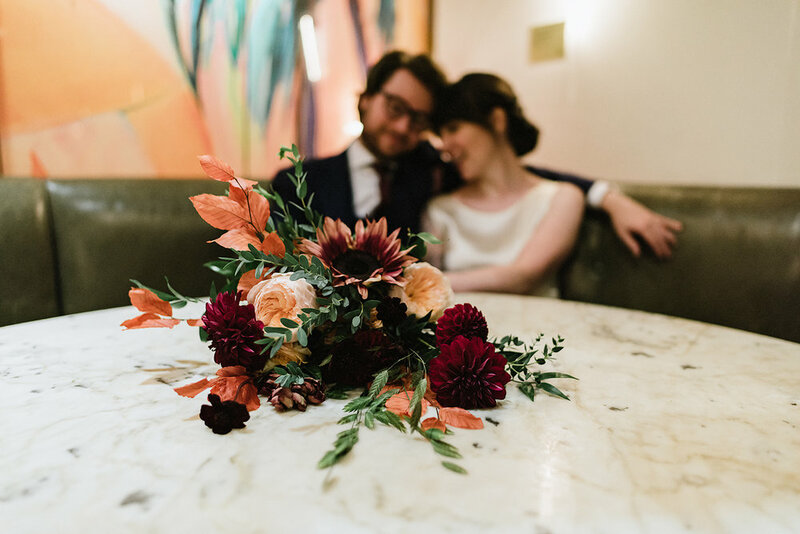 There are few places in downtown Toronto that would make for an ideal all-in-one location for a wedding, and with their modern-vintage aesthetic, the Drake Hotel provided an atmosphere that highly resonated with Courtney & Justin’s appreciation for the arts and their love for the unordinary. 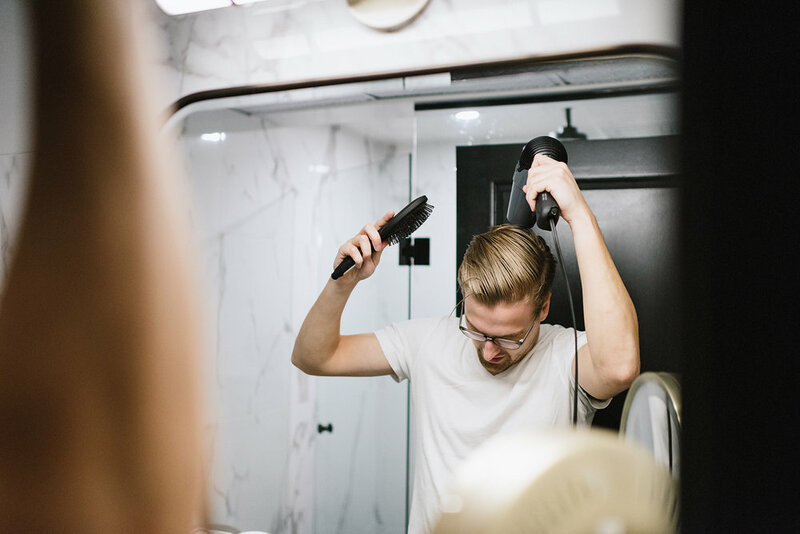 Getting ready in the same hotel room, Justin suited up while Courtney finished the final touches to her hair and makeup, surrounded by the Drake Hotel’s iconic bizarro vintage decor and aesthetic, including a creepy painting of the Queen (?) with her eyes poked out. 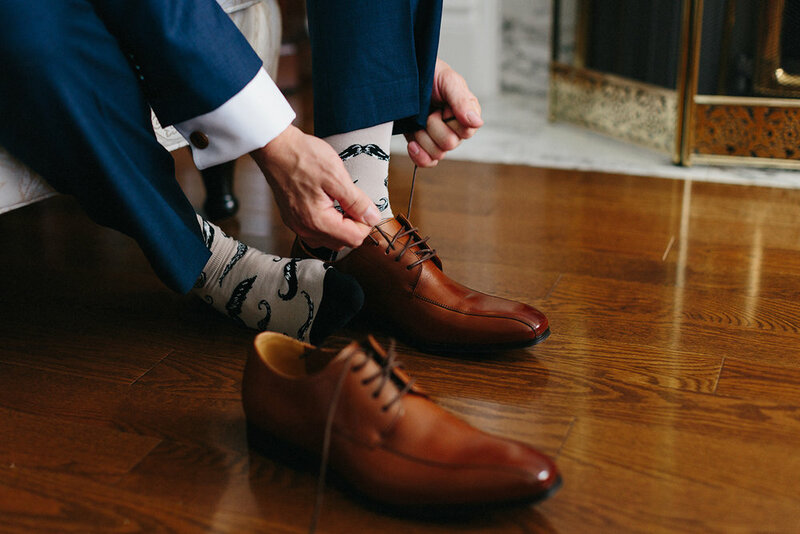 Those little details, as subtle as they may have been, without a doubt added to the vibe of the wedding day. 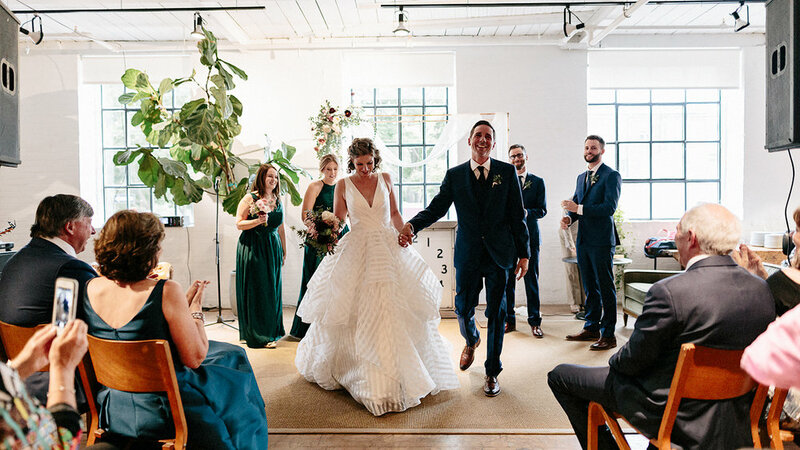 The bride’s background as a ballet dancer was very apparent, with her grace and sophistication being the perfect partners for her authentic vintage dress and style. I’d like to point out, that when I say vintage, I really mean VINTAGE, a real ANTIQUE of a dress. 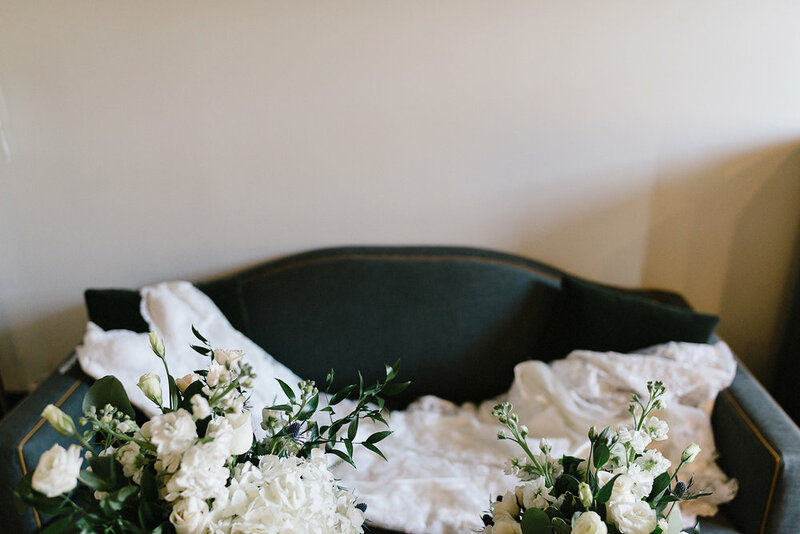 Dating back to the 1930’s, Courtney’s dress provided this long-lost subtly and simplicity no longer found in modern-day wedding dresses. 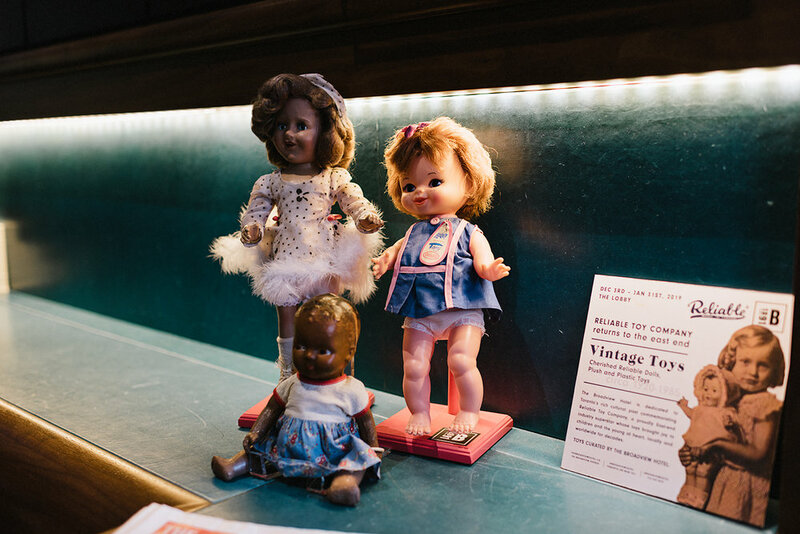 It was truly a time capsule, and Courtney’s personality fit it perfectly. 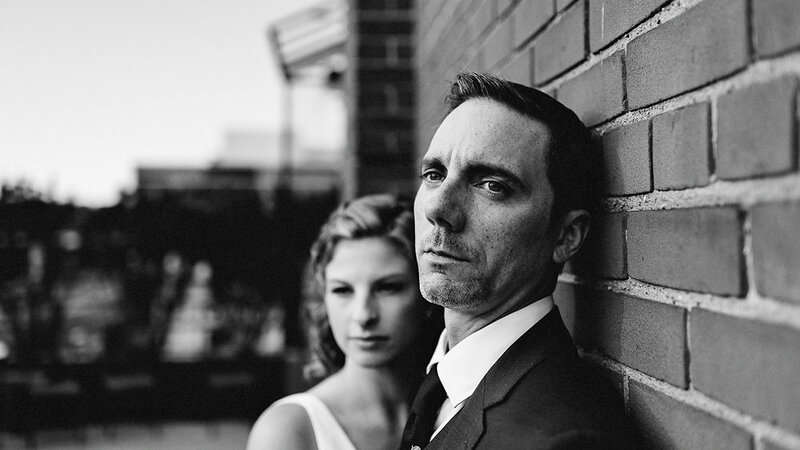 Usually couples tend to choose to elope because they want something highly personal and deeply intimate. 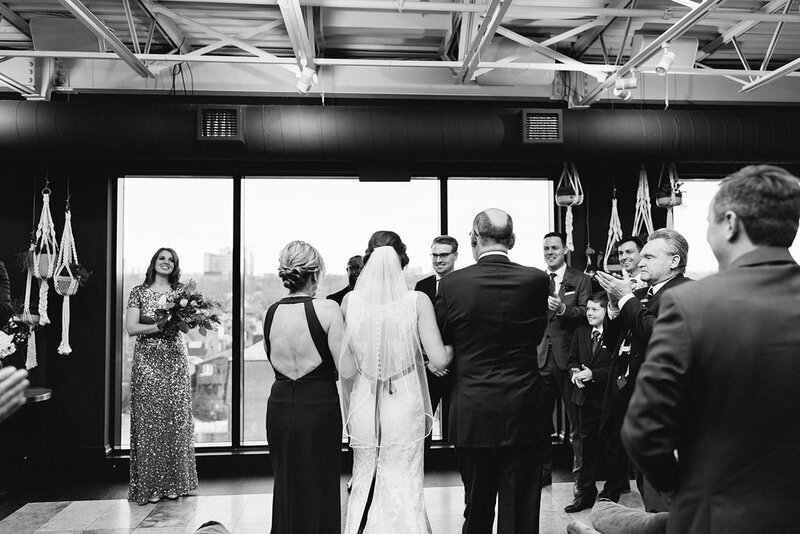 With a total of 6 people (counting the Bride and Groom), the Drake Hotel’s sky lounge modern artistic flair set the stage for the intimate and emotional ceremony. 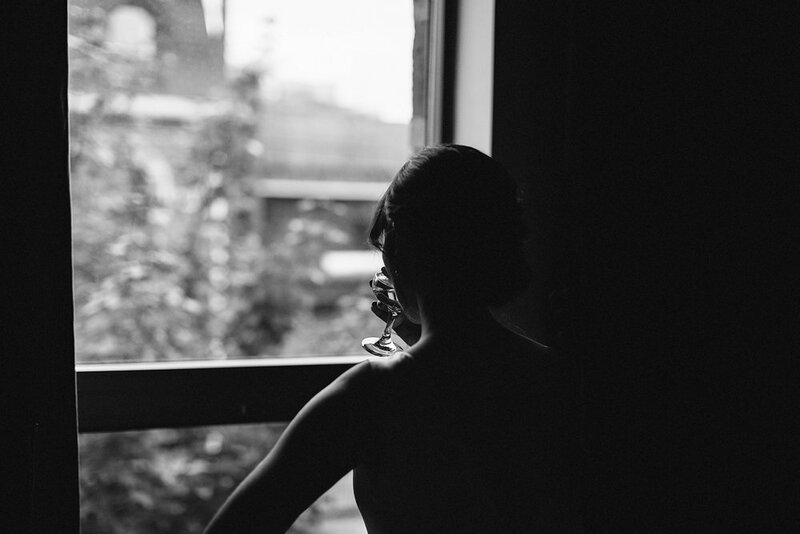 Another bonus of the bride and groom’s choice of eloping at the Drake Hotel was our ability to have the entire hotel at our disposal for beautiful, natural and intimate portraits. 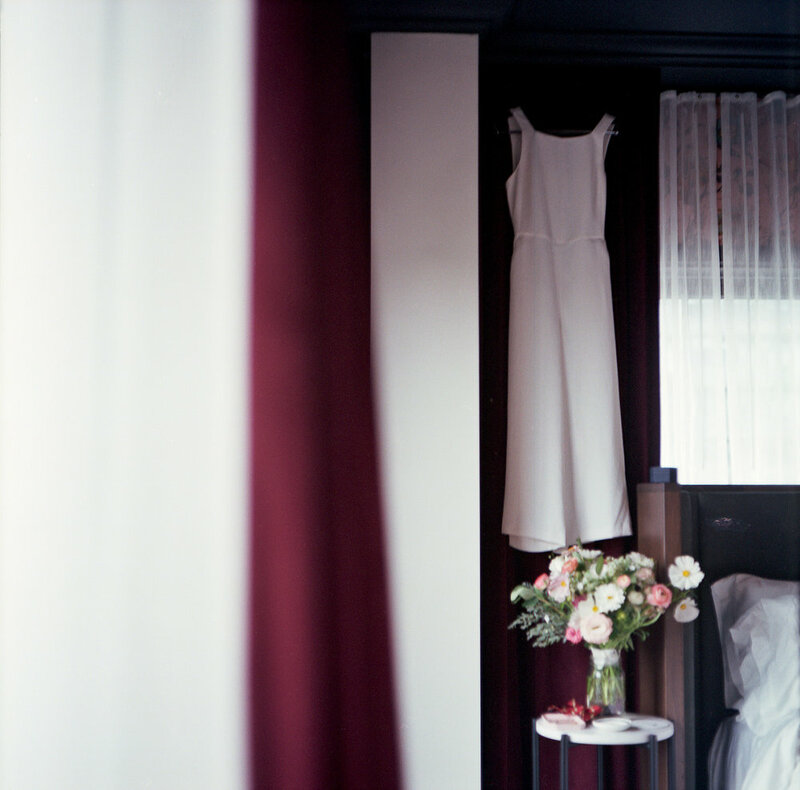 With every room and every corner of the hotel adding a new dimension and character to the ambiance, providing endless opportunity to document the bride and groom’s first moments of marriage, absorbing every minor detail, but most importantly, allowing them to gather their emotions and take in the fleeting moments. 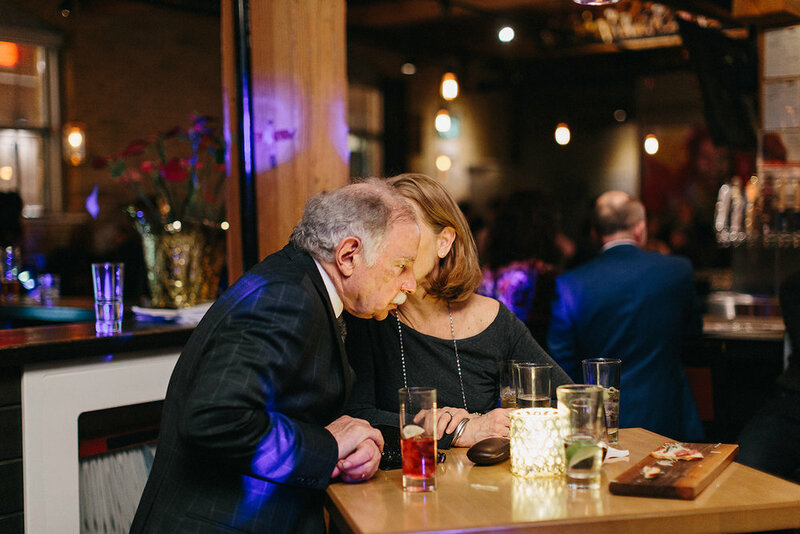 It was a beautiful experience to be a part of such an intimate wedding, but what truly made it great was being able to witness first-hand the deep affection that resonated between Courtney and Justin. 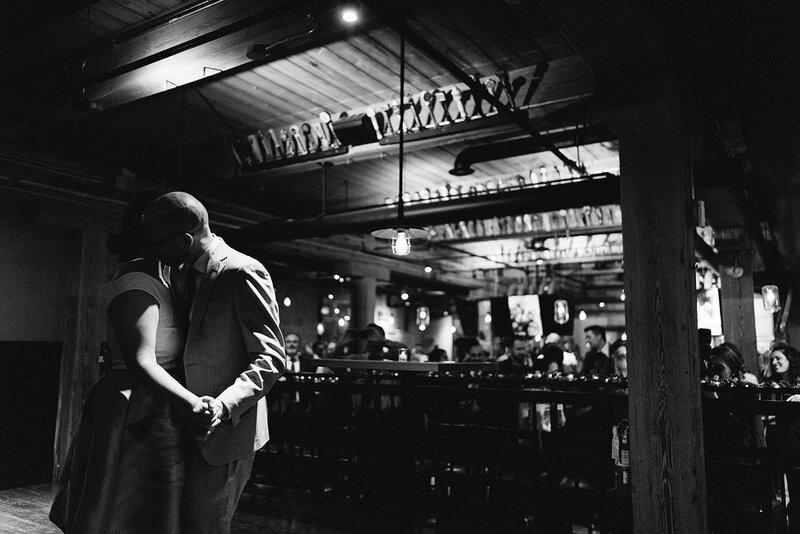 There seems to be something about elopements that brings out this unwavering love and affection between those involved. 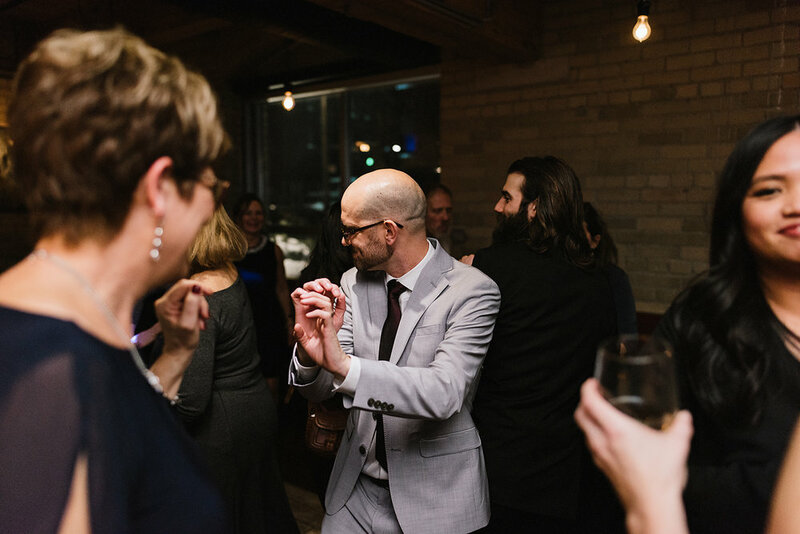 It’s incredible and something I look forward to being part of again sometime in the near future, and hey, if it happens to be at the Drake Hotel again, then all the better. 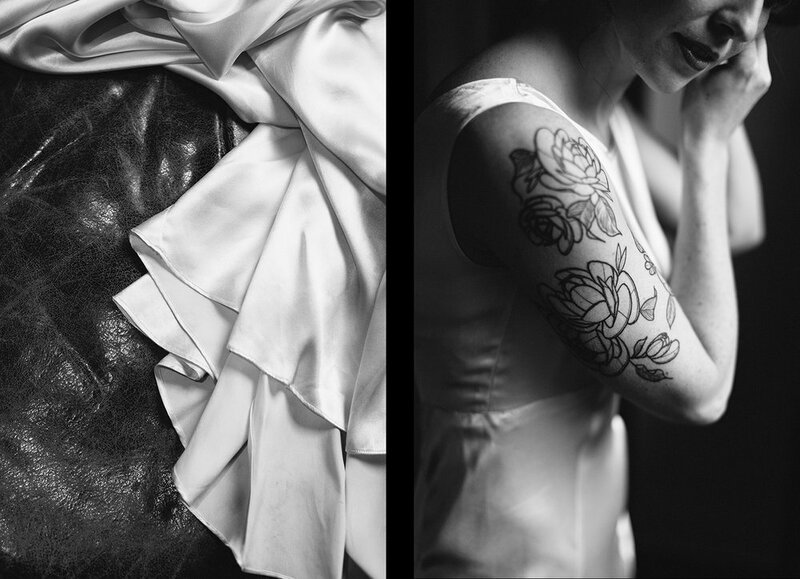 It’s an amazing feeling to have two highly-creative people trust you enough to capture something so deeply personal and important to them, and it’s also humbling that such a fantastic venue trusts me enough to include me in such a personalized and intimate experience. 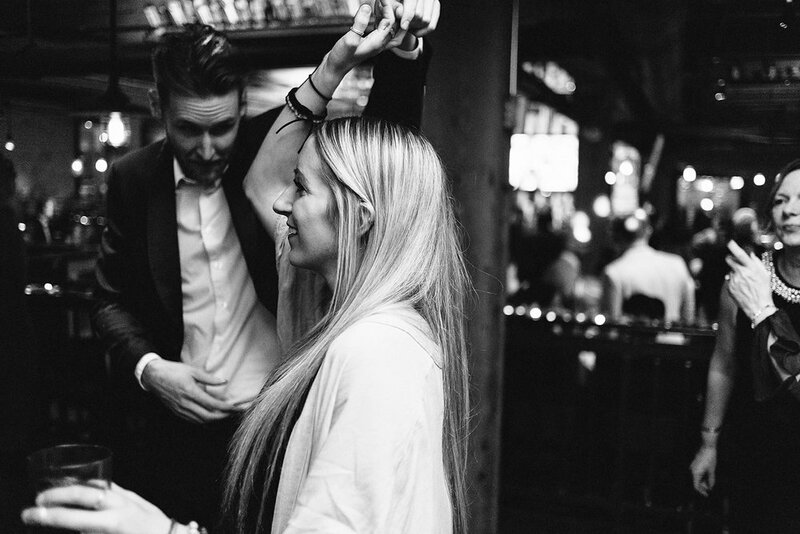 So to the Drake Hotel, to the bride and groom, thank you. 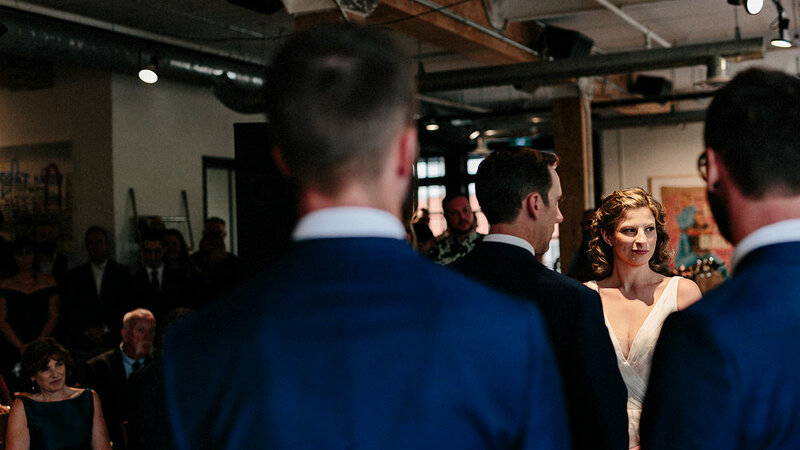 Kelly and Tyler’s East Room wedding in downtown Toronto was the perfect mix of old and new, it’s only fitting that two extreme horror movie buffs would pull off such a modern industrial wedding with cinematic flair. 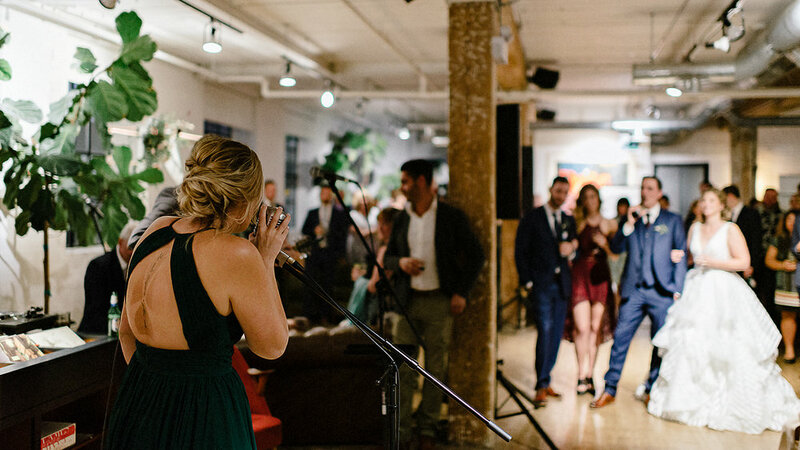 There were a few amazing coincidences that really brought out a natural and heightened creative perception in me when I was documenting Kelly and Tyler’s wedding at the East Room. First, I’m a huge cinema fan, horror especially. 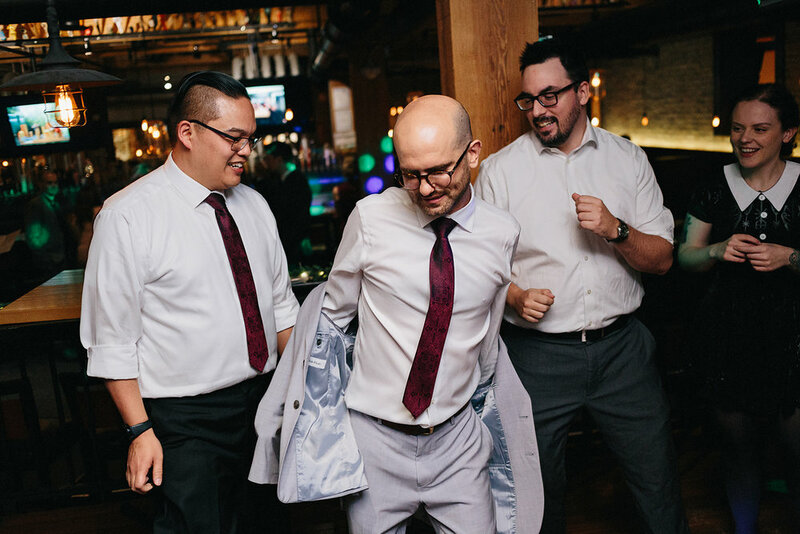 I think the week leading up to the wedding I watched the following movies - “Mandy”, “Beyond the Black Rainbow”, “Drive” and “Only God Forgives”. For those unfamiliar with those films, let’s just say they are highly visual films with unusually beautiful visual aesthetic. Second, a lot of my personal photography projects revolve around photographing and documenting anachronistic scenes reminiscing of my childhood and many other nostalgic factors, the majority being old vintage cars. 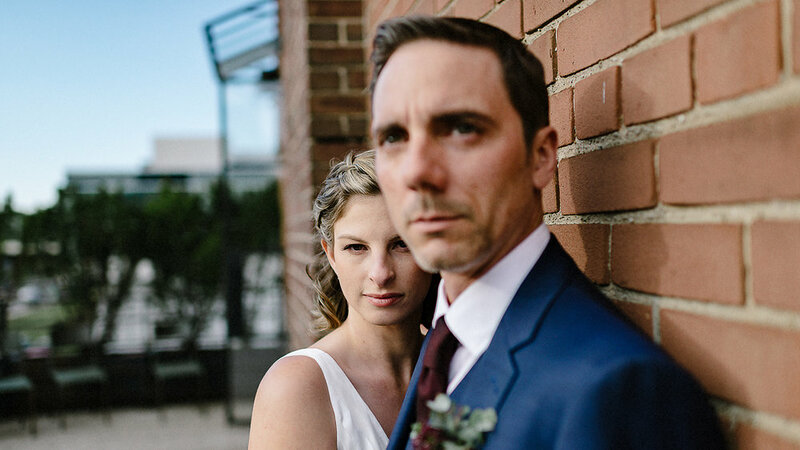 As you’ll see further throughout the blog post, Kelly and Tyler unknowingly set up the ultimate locations and scenarios for me to create some of my all-time favourite portraits of a bride and groom on their wedding day. 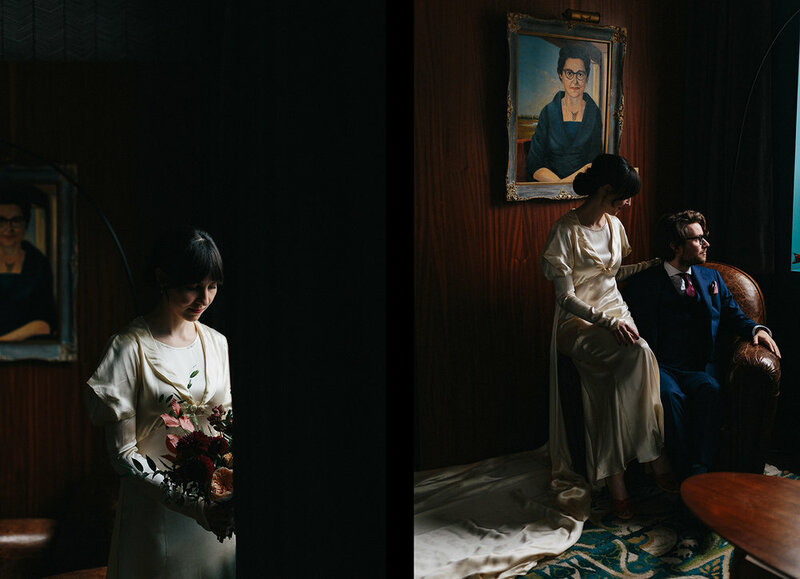 To honour both the bride and groom’s appreciation for the cinematic, along with my creative subconscious pulling me into a specific direction, I photographed several frames throughout the day in 16:9 format to truly encompass that cinematic an documentary feeling of the wedding day. 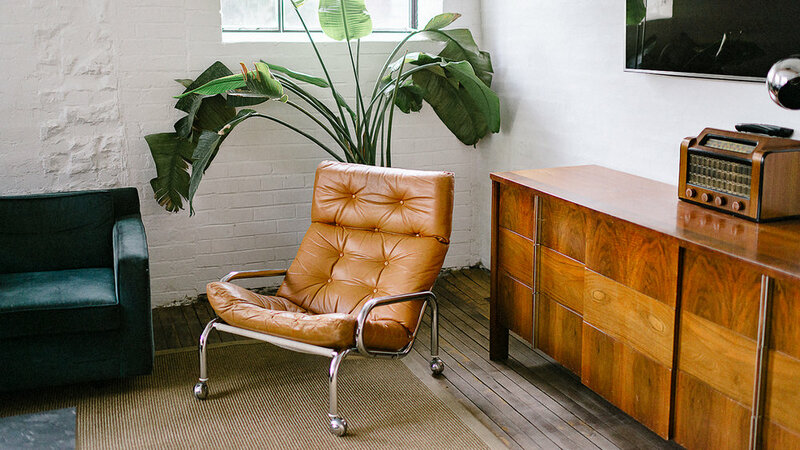 It only makes sense to pay homage to that by showcasing those images exclusively in this blog post. 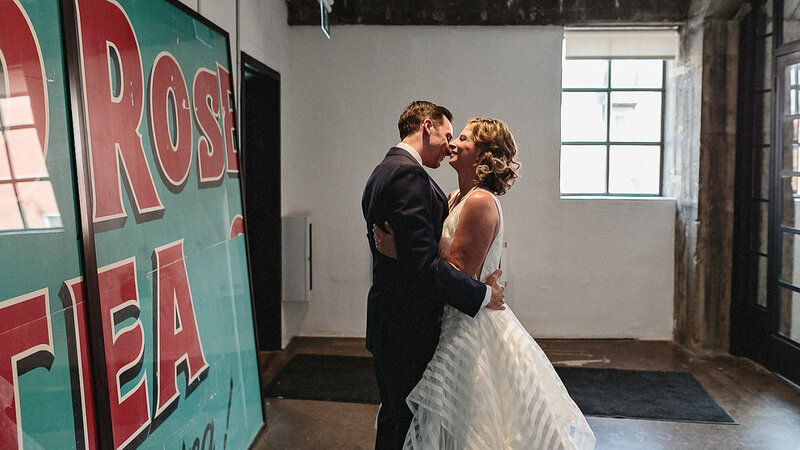 The day kicked-off with the bride and groom having an intimate and candid moment together with a first look in front of a genuine vintage poster, followed by some bridal party photos outside of the East Room. 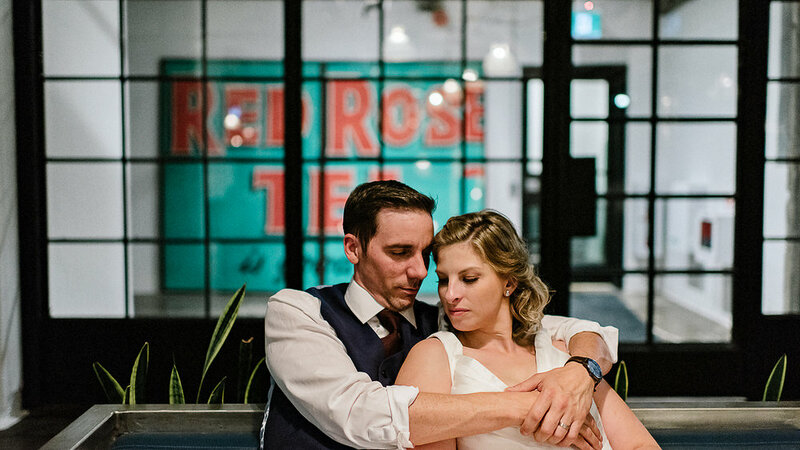 On any normal day, the vintage and rustic vibe of the East Room’s red brick and industrial setting would be more than enough to capture some great images. 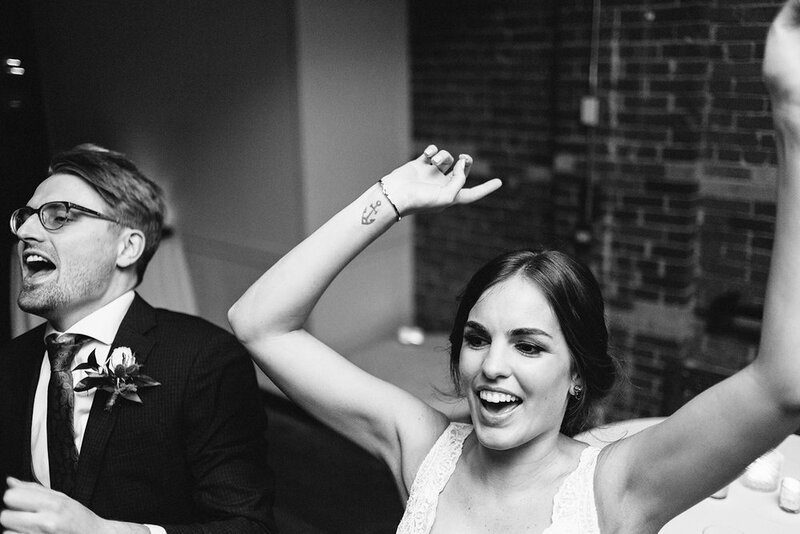 The bride and groom really kicked things up a notch when they got (tricked?) 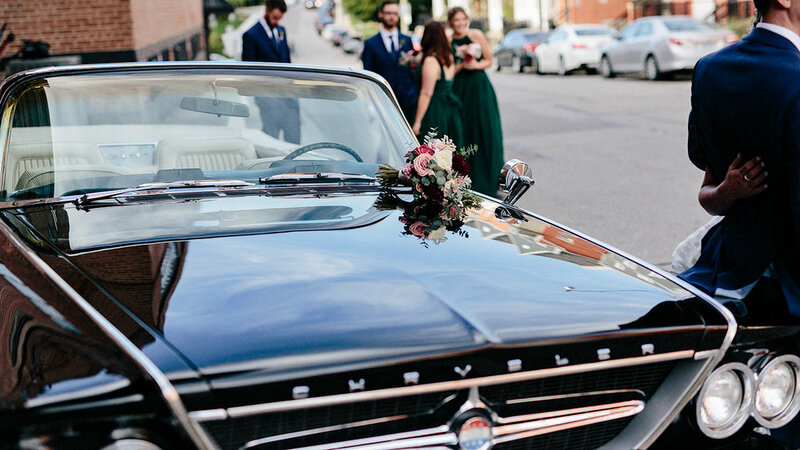 one of their wedding guests to let us use his vintage Chrysler. 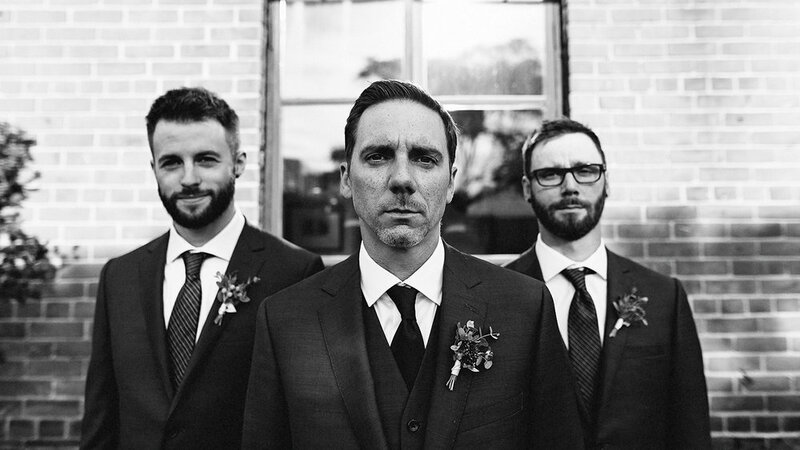 I couldn’t pass up the opportunity to make Tyler and his brothers look like the new leads in a remake of Reservoir Dogs. 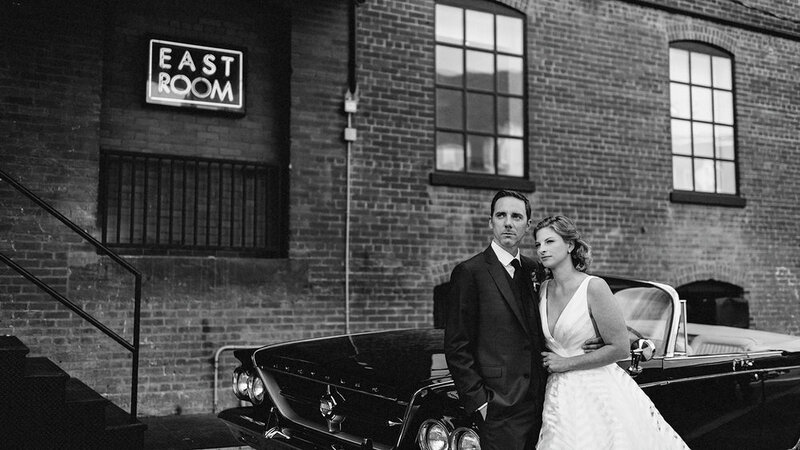 To continue with the trend of cinematic mood, the bride and groom made the most of the East Room’s interior vintage industrial space to capture some candid moments together and ultimately enjoy some time alone before the whirlwind ahead. 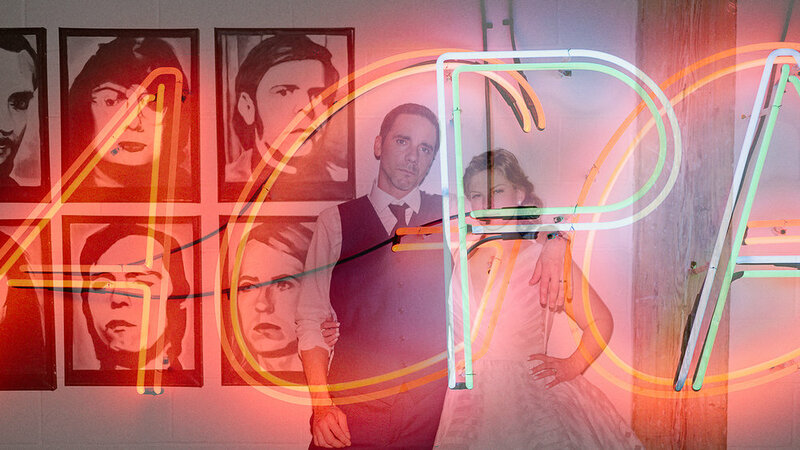 Aesthetically, I think the whole neon vibe was subconsciously present, something which the East Room delivers with their beautiful neon artwork staggered around the building, providing Kelly and Tyler some incredibly dark and moody locations to have a little bit of their appreciation for the dark and gloomy come through in their portraits. Although the first part of the day seemed like being on a movie set, or like an editorial photoshoot, it didn’t feel that way at all. 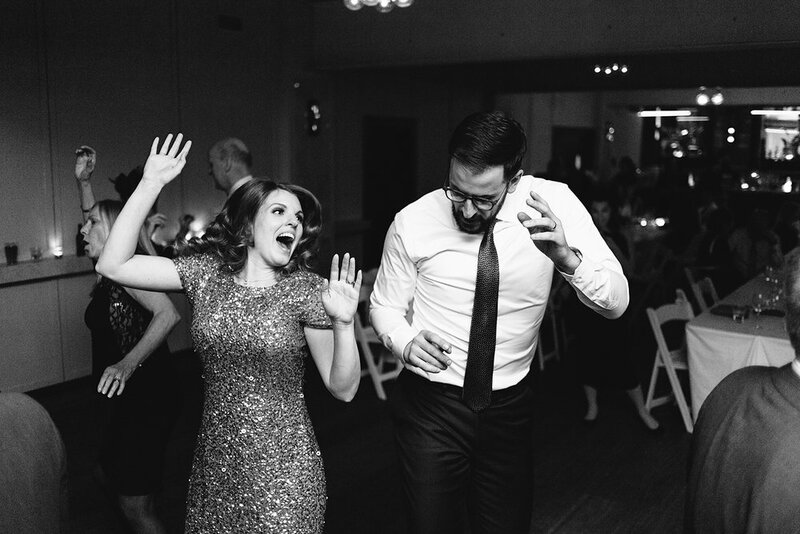 Kelly and Tyler naturally gravitate to these elements and I’m glad their authentic selves and their genuine personalities came through in those moments. 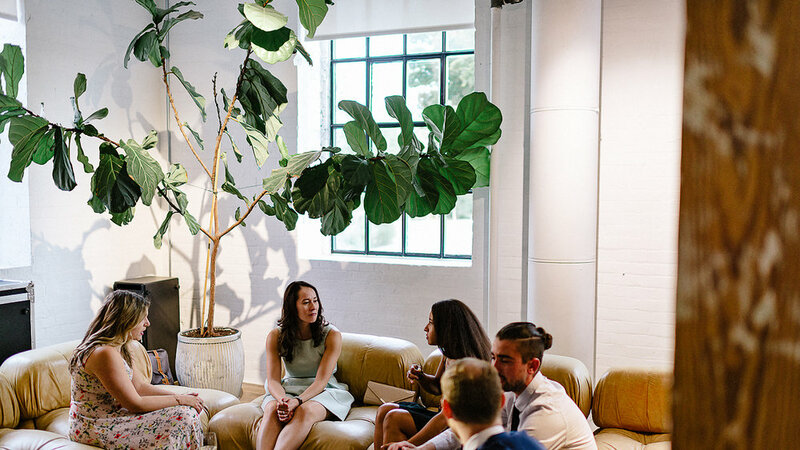 The ceremony and reception were held inside the East Room’s main area, providing an incredible environment that showcased old Toronto aesthetic with their brick walls and industrial elements, the vintage leather couches and chairs popped in contrast to the beautiful reclaimed wood furniture. 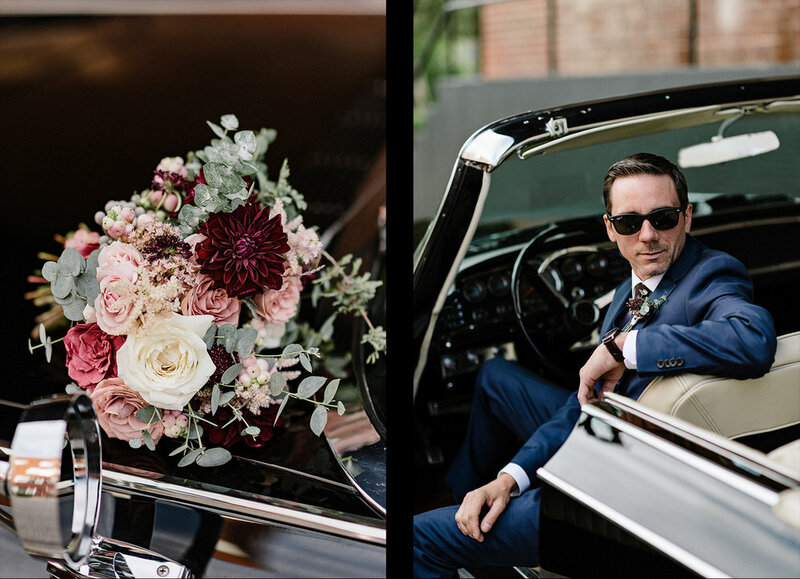 That modern-cool 70’s aesthetic was alive and well, and it couldn’t of been more exact to the entire vibe and mood of Kelly and Tyler’s wedding day. Just because the day naturally played out in cinematic fashion doesn’t mean there wasn’t plenty of genuine and emotional moments, quite the opposite in fact. 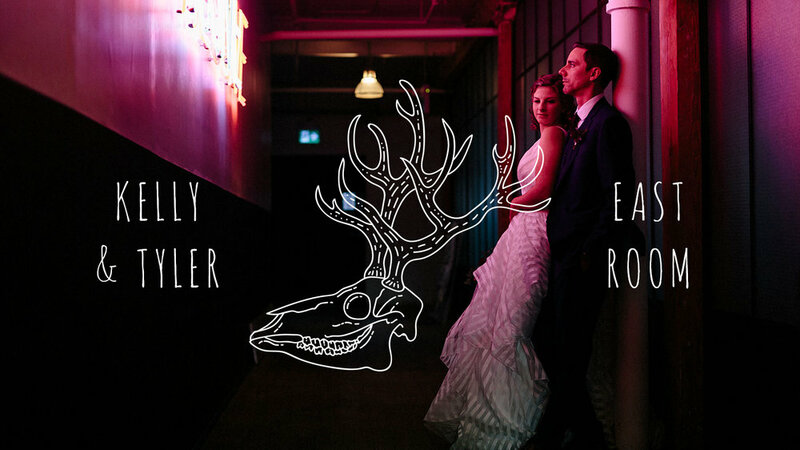 The bride’s sister / maid of honour, with the help of the live band, kicked off the reception with a professionally executed parody of The Dixie Chicks “Goodbye Earl” in which the lyrics tell a story of Tyler and his creepy horror movie memorabilia collection that foreshadowed Kelly’s impending doom. Roasting Tyler about this aspect of his life was an ongoing theme throughout the evening’s speeches. 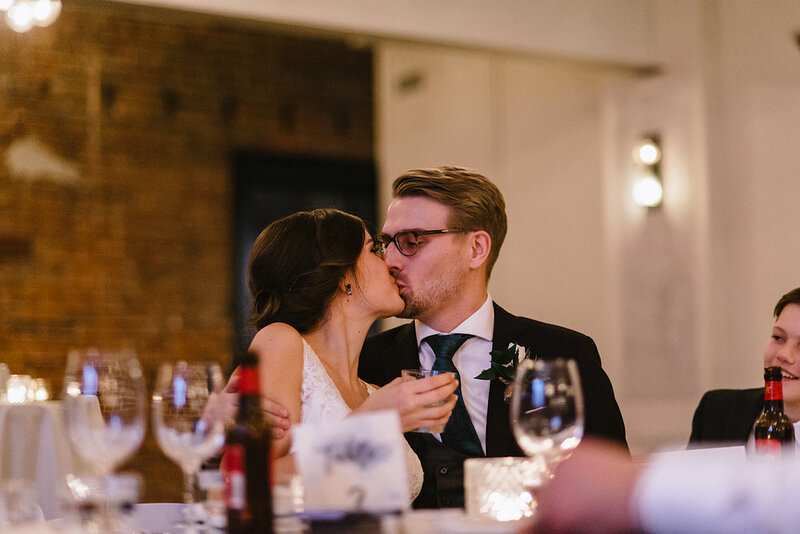 I will admit however, that for a guy who’s so into blood and guts, he did manage to provide me with one of the cutest moments (sorry Tyler) I’ve ever captured at a wedding when I caught him wiping away his bride’s tears with his tie. 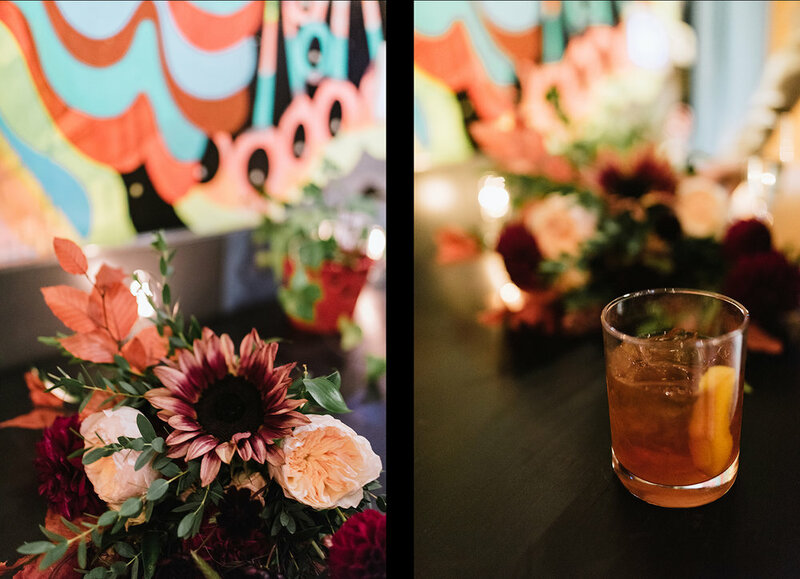 With good drinks and amazing food by Grand Electric, a homestyle BBQ serving of fried chicken and ribs, the stage was set for an evening of letting loose and creating memories with their loved ones. 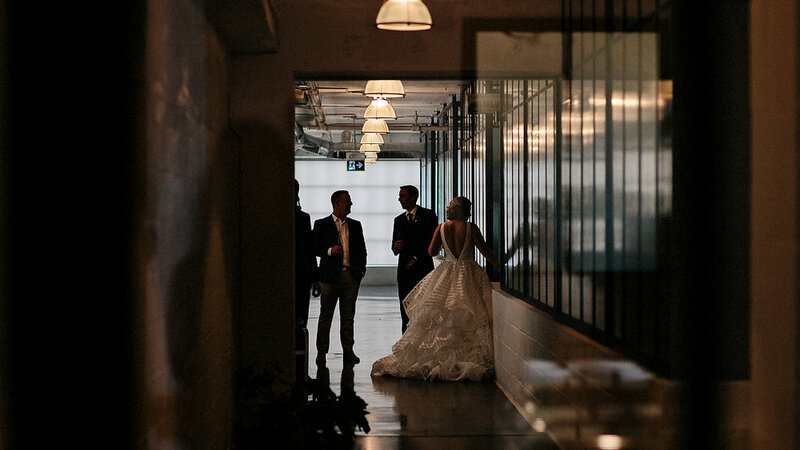 For the first time as a documentary wedding photographer in Toronto, I was spoiled with literally having every single element of my creative influences come together in one moment in time. 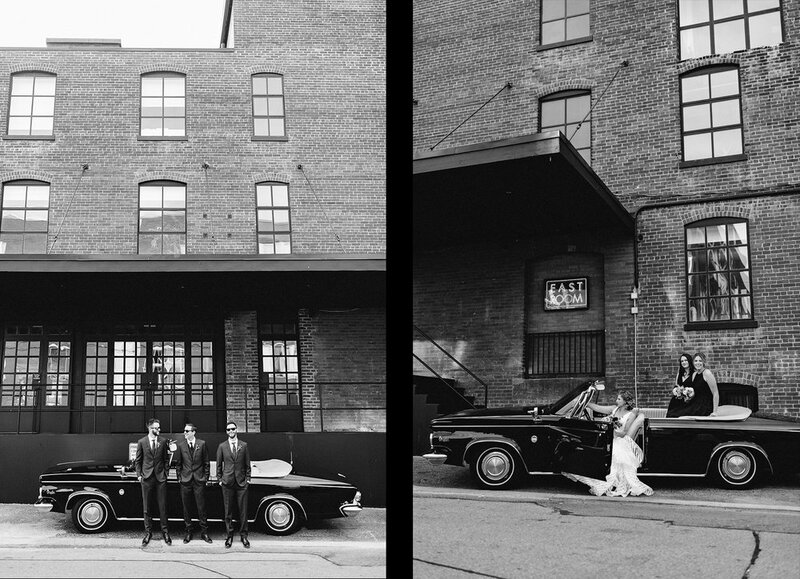 The East Room’s industrial vintage modern 70’s aesthetic, the vintage car, neons signs and vintage movie posters / records, it all had the essence of Kelly and Tyler, and that’s what really came through in the images and I’m grateful to have been included in such a naturally cinematic moment in their lives. 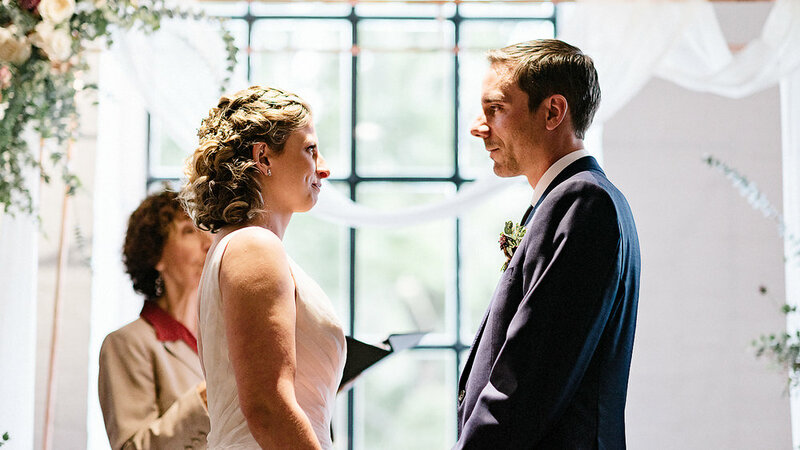 Elisha and Matt’s intimate wedding at Dowswell Farm in Beaverton Ontario was nothing short of spectacular. 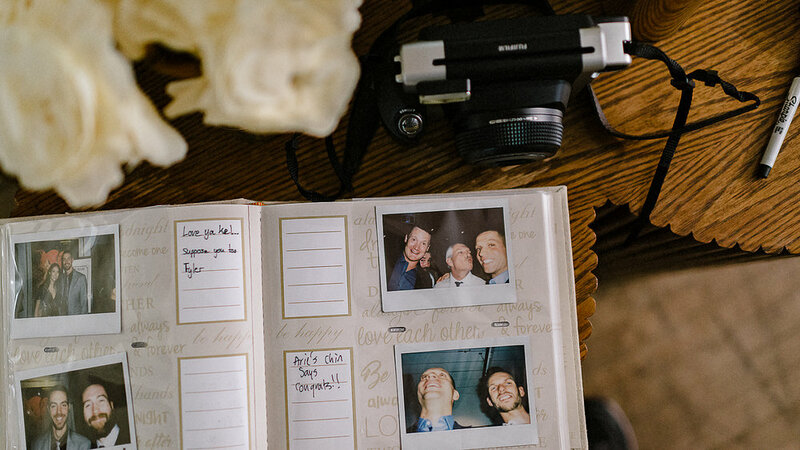 The authentic and rustic vibe of Dowswell Farm created the ultimate atmosphere for the the bride and groom to showcase vintage details, but most importantly, to officially unite their family. The spirit and essence of family was a large reoccurring theme throughout the wedding day, with numerous elements paying homage to their current families, but most importantly, the wedding day was an official right-of passage for the Bride and Groom to unite their own family, in the presence of their young baby boy Maddox. 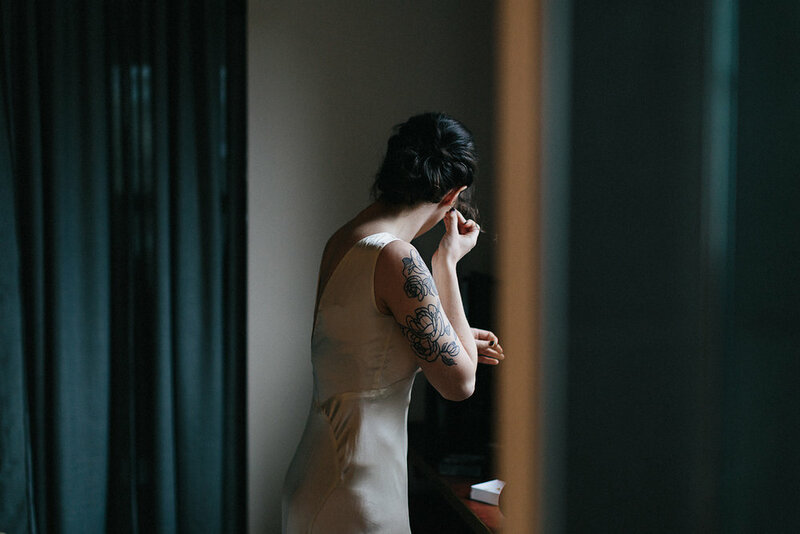 The morning of the wedding was one of the foggiest days I’ve ever seen and having a moment to take in the fog roll in over Lake Ontario near the hotel where Elisha and her bridesmaids got ready was an incredible way to get my creative vision rolling. 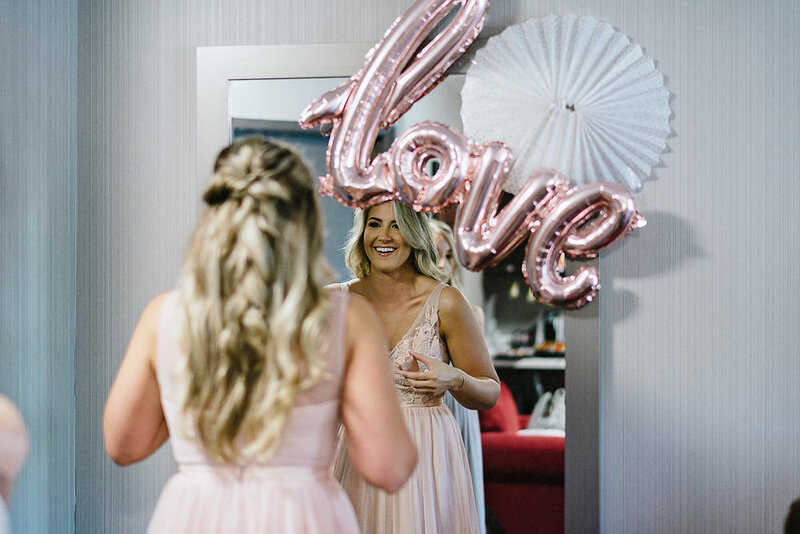 With her friends and family gathered within the confines of the hotel room, Elisha couldn’t contain her excitement as everyone got their hair and makeup ready, looking forward to showing off her beautiful modern vintage bridal look to her closest. 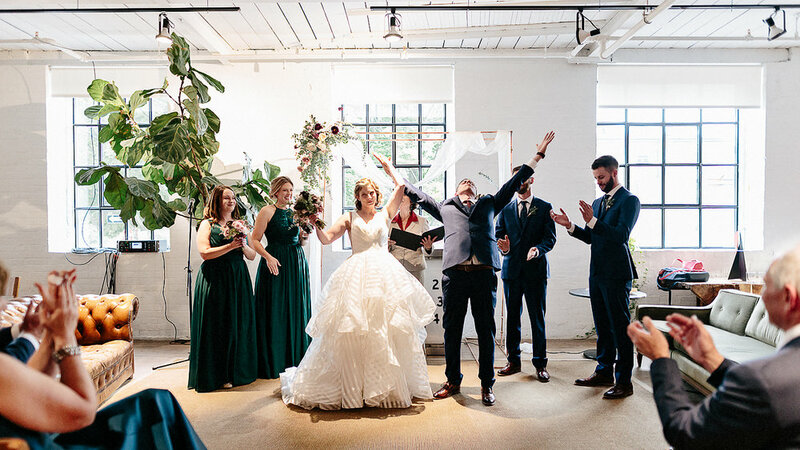 A large part of her excitement was the mere fact she was able to get her wedding vision complete by having her wedding held at Dowswell Barn in the first place, something she worked very hard to accomplish, and it was totally worthwhile. 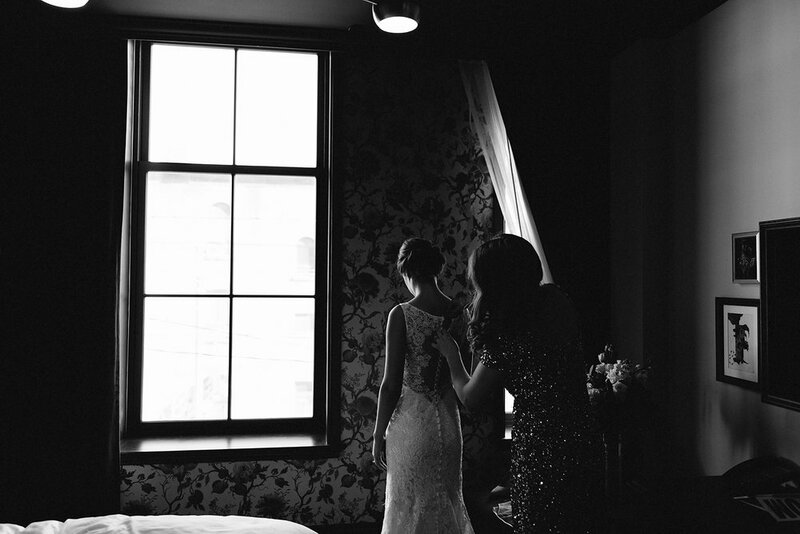 With the beautiful summer morning light coming through the room, the stage was set for beautiful and genuine candid moments between the bride and those in her presence that morning. 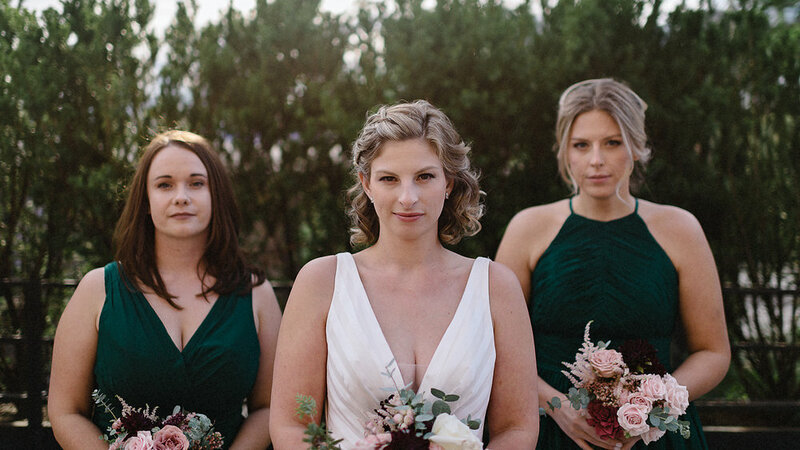 With Elisha’s mother and one of her bff’s giving Elisha a hand to put on her custom gown, the bride’s mother was unable to contain her emotion as the beautiful bride revealed her completed look. 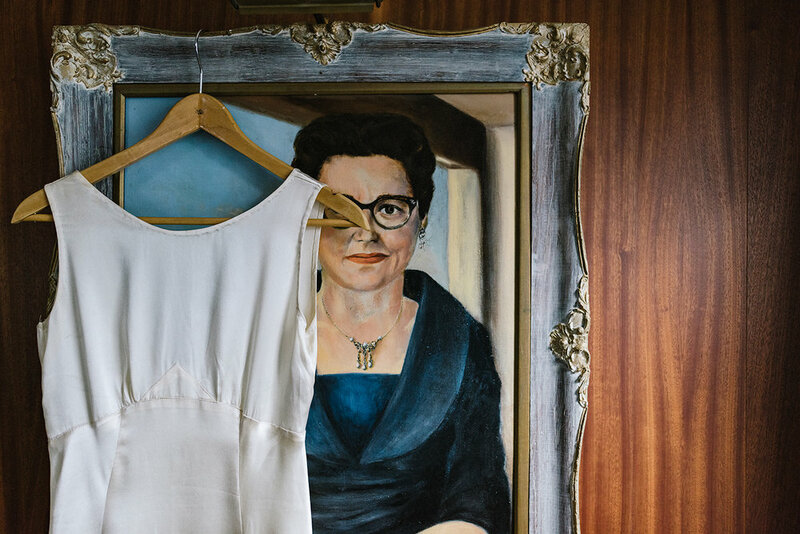 Before the wedding day itself I knew how important family was to Elisha so it didn’t surprise me to see minor details paying homage to that even within her modern-vintage bride look. An incredible detail she included was wearing a pendant that contain the ashes of her grandfather. A beautiful touch to have someone significant in her life remain close to her heart in a monumental and important event. 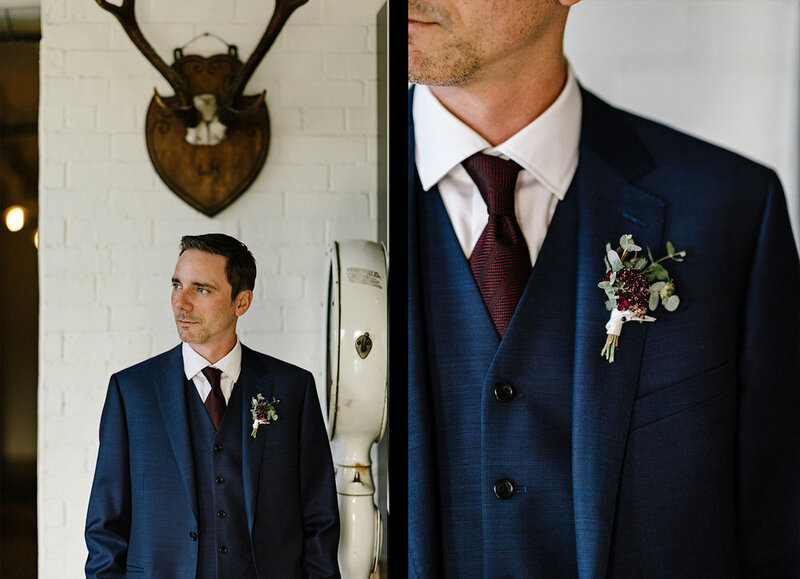 As the bride and her crew wrapped up getting ready and rushed off to Dowswell Farm for the wedding celebration, Matt and Maddox got dressed back at the groom’s parents house in Georgina. 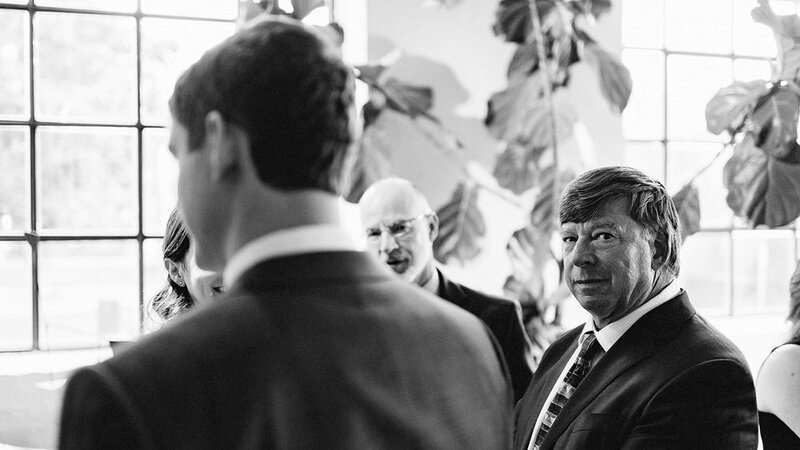 Seeing the bond between Matt and his son as they got ready together was memorable. Maddox’s mini suit and shoes were beyond adorable if I can admit. 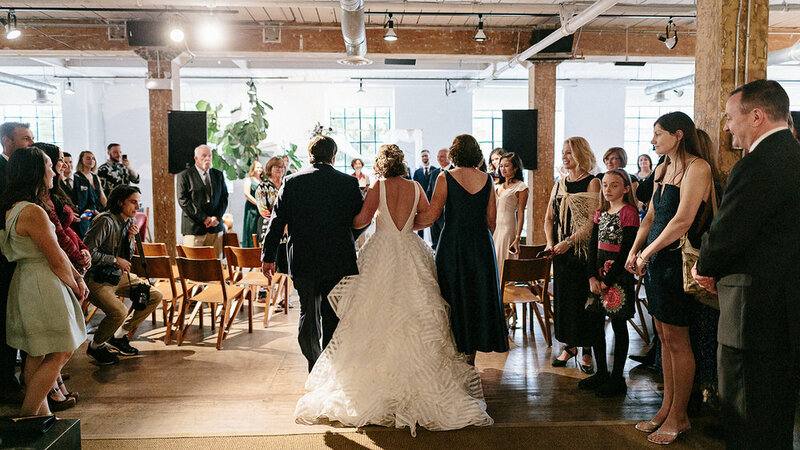 The wedding ceremony symbolized and manifested both the bride and groom’s family and heritage. 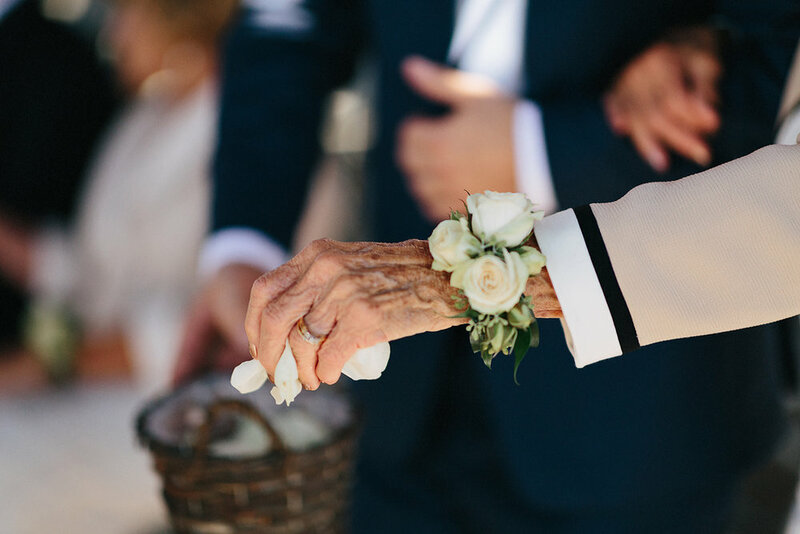 Maddox playing the role of ring-bearer, refusing to walk down the aisle without the assistance of his dad was equally as cute and memorable as Matt’s grandmother playing the role of flower girl, also walking down the aisle with the assistance of the groom. 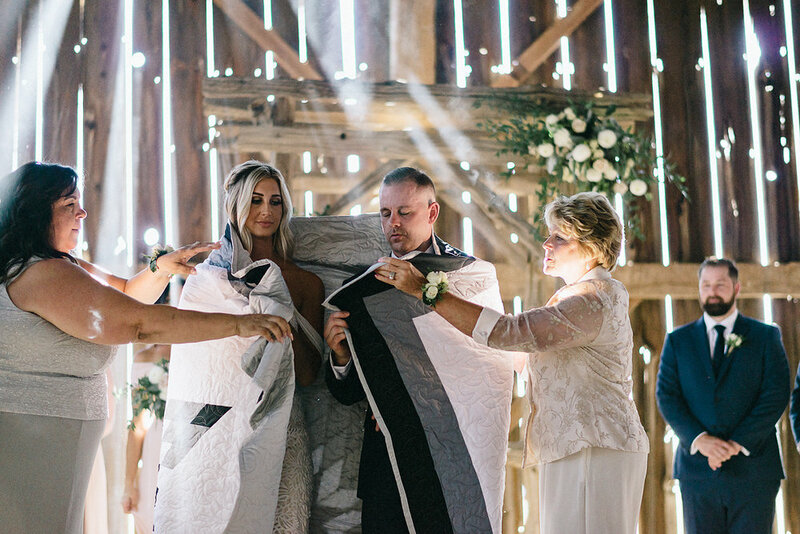 On the flip side, to honour Elisha’s aboriginal heritage and family, there was a traditional blanket ceremony performed by the aid of one of the bride’s cousins. 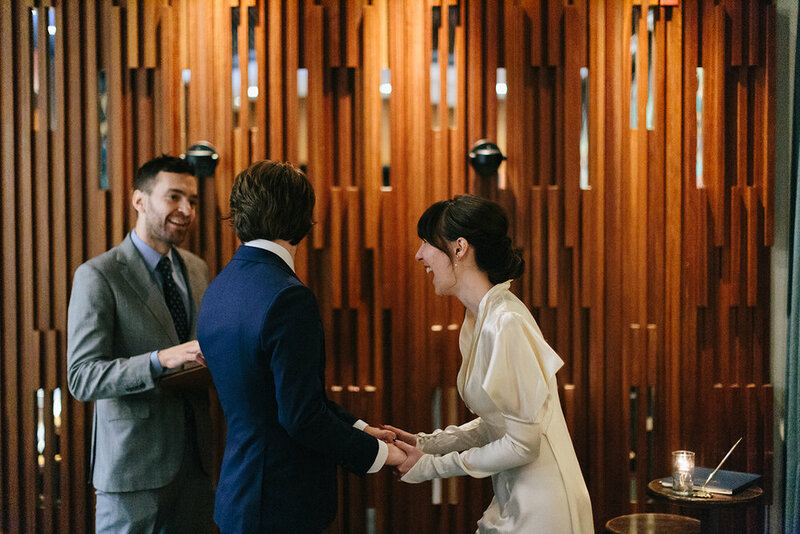 The ceremony brought forth a sense of calm and spirituality that I haven’t ever witnessed during a wedding ceremony. 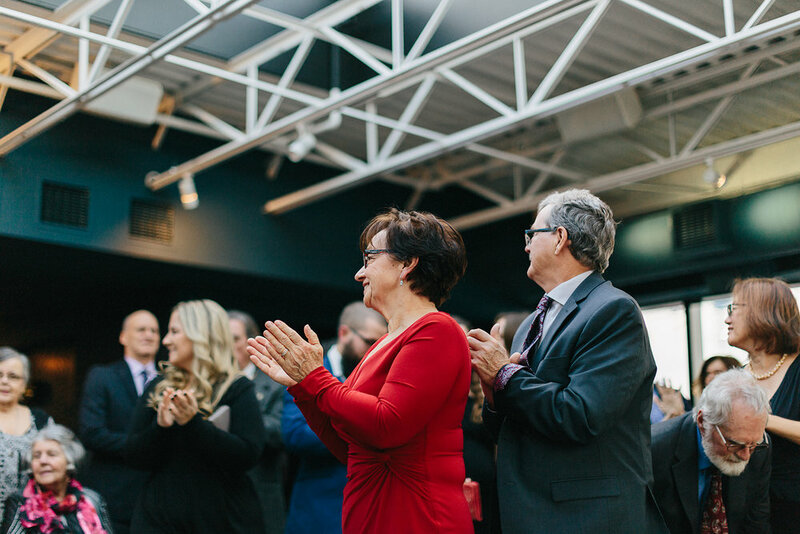 It was utterly beautiful and impactful, something that resonated with everyone in attendance, including the bride and groom. 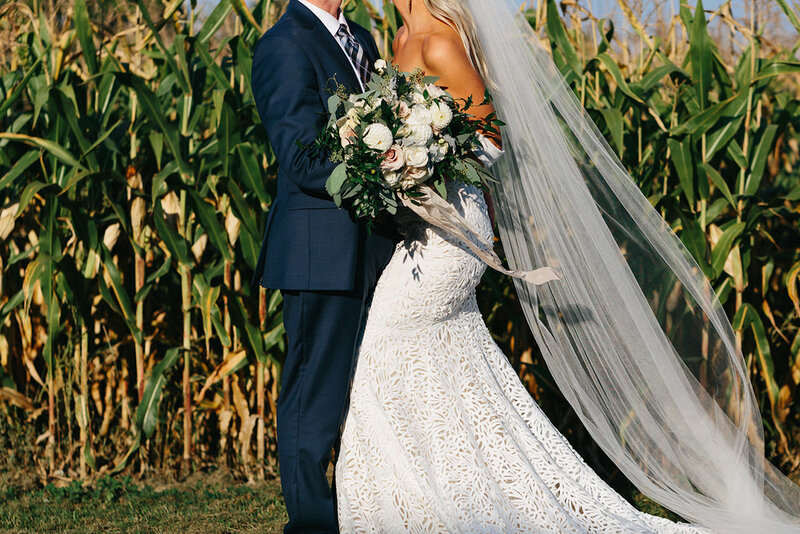 Once the Dowswell Barn wedding ceremony finished up, the bride and groom along with their bridal party made the most of the rustic environment that Dowswell farm has to offer, allowing us to capture and document intimate and candid portraits within a cornfield around the farm’s numerous barns and locations. We were treated with the summer’s most beautiful and poignant sunsets. 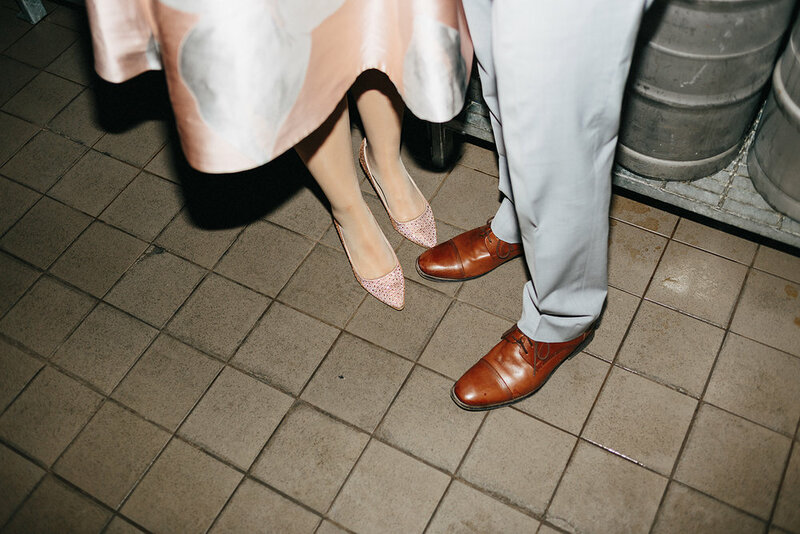 The clouds had a hue of pink and shades of purple as the bride and groom appreciated every second of it as they spend some quiet time alone together before dinner. 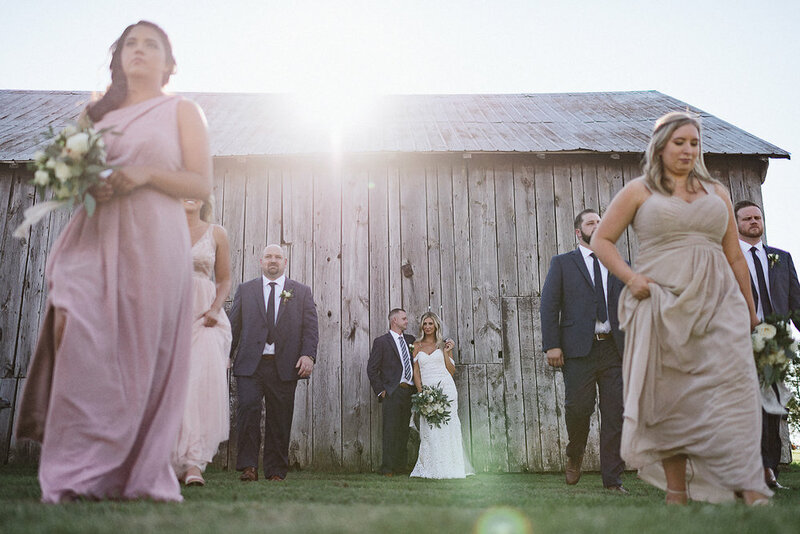 A big bonus of having your wedding on a farm is that you have few distractions and limitations when it comes to witnessing the beautiful sunsets that nature has to offer. 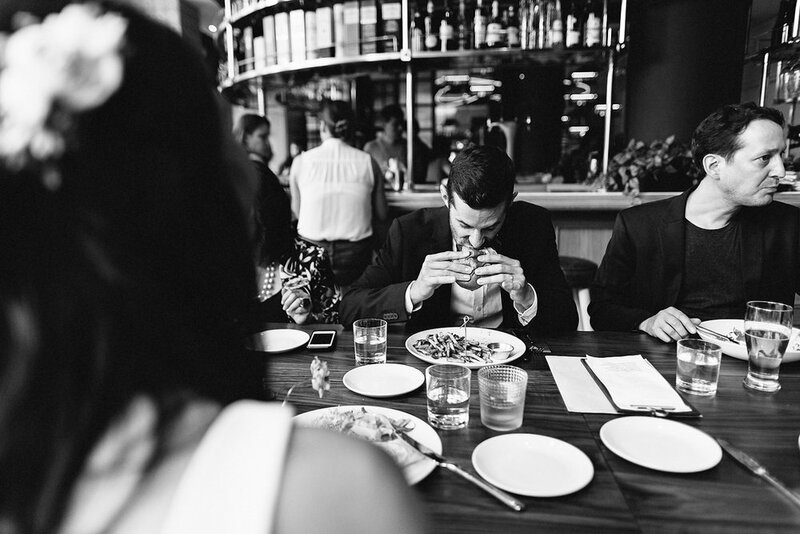 A far cry from the usual chaos and distractions that come from photographing weddings in Toronto! As the light began to dwindle and seep through the cracks of Dowswell Barn, the bride and groom took a moment to share in an intimate moment and dance together in the middle of the barn, creating a surreal and cinematic moment that was purely instinctive and natural, chasing the light and making the most of every moment, allowing me to capture it purely as a documentary wedding photographer, allowing my photojournalistic approach to take over and providing the bride and groom a moment of quiet intimacy to gather their thoughts and emotions. 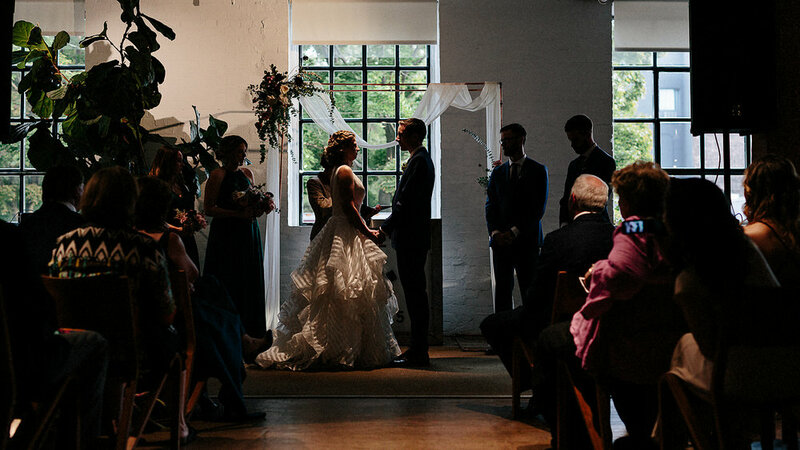 Something I absolutely loved about Dowswell farm’s barn was how authentically rustic and vintage it was, providing slivers of light to seep through from all directions, providing beautiful natural light in every corner for every moment, truly breathtaking. 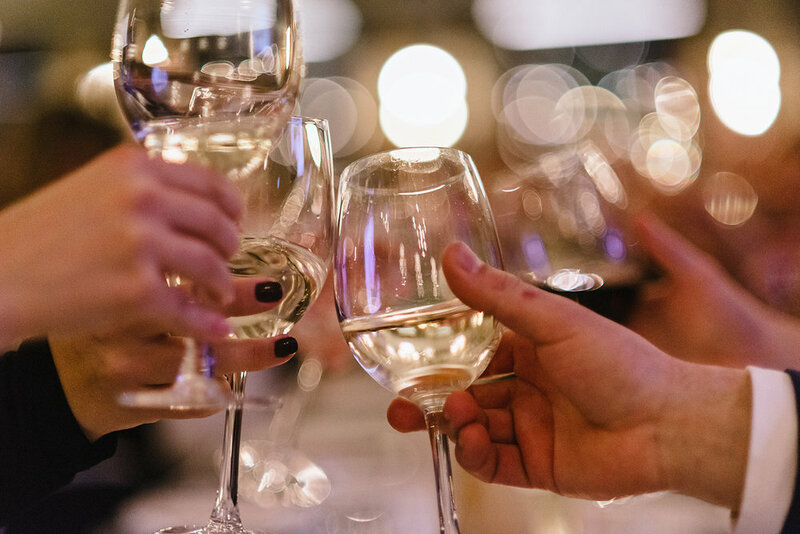 Once the light faded dinner began to be served as we were treated to authentic smoked BBQ, copious amounts of wine, and genuine speeches by close members of the bride and groom’s family. 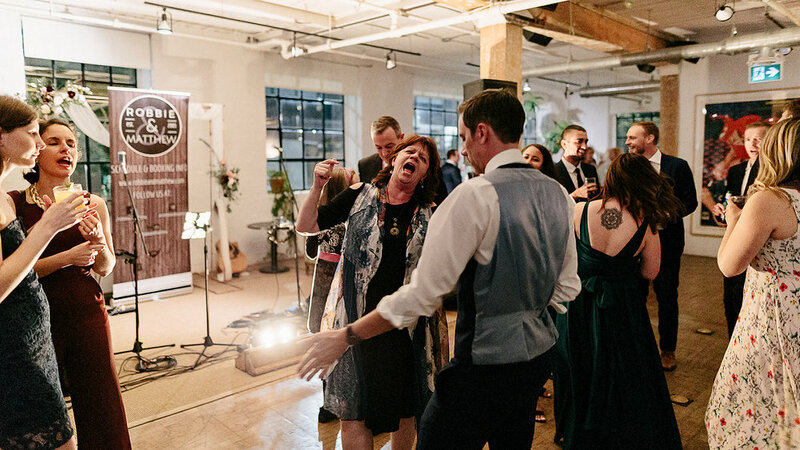 Something that was truly beautiful and natural about the entire wedding reception was Elisha and Matt’s unwavering attention and inclusion of their son Maddox. 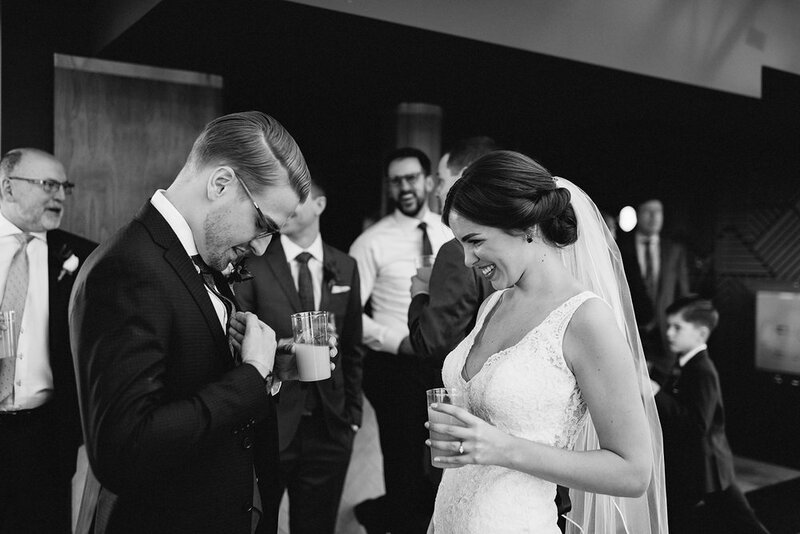 They subconsciously included him in every joyous moment, every tear shed and every detail of the wedding day. 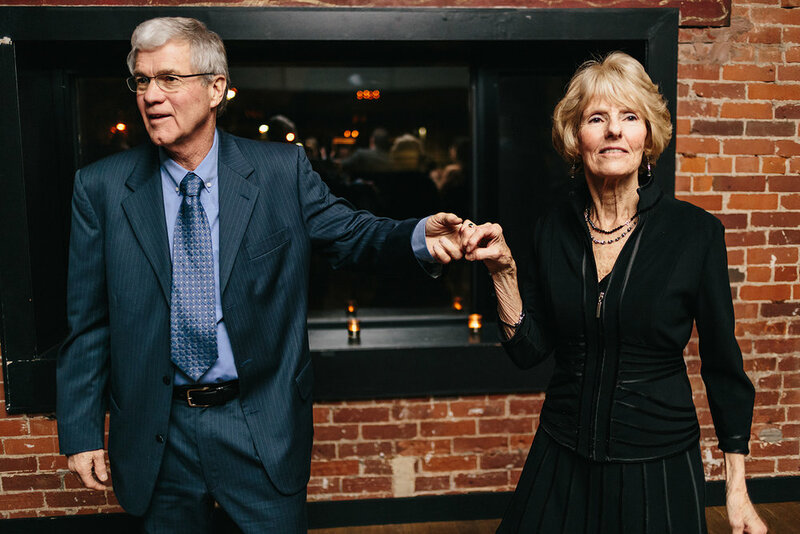 It was equally about their union to each other as it was a commitment to their son and their immediate family. 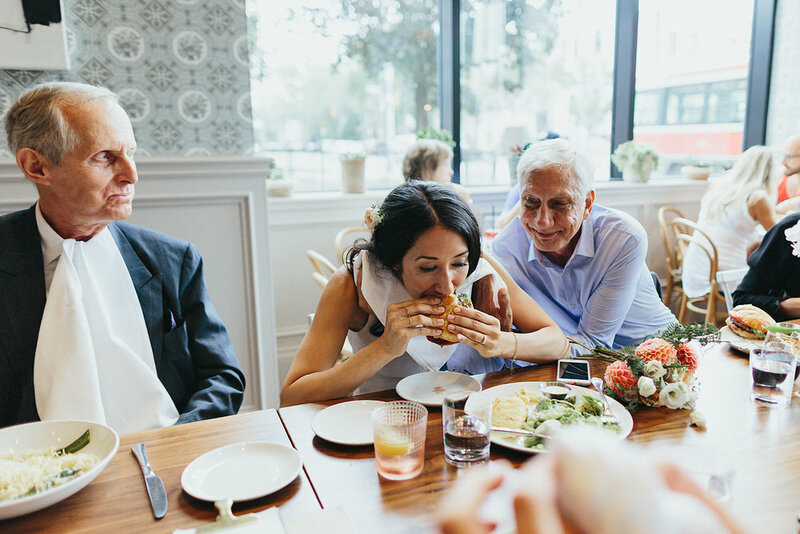 Despite being beyond full from the amazing BBQ dinner served at the wedding reception, Matt and Elisha had a few late night surprises in store for their guests. I remember hearing a faded tune in the distance along with some faded neon lights approaching. 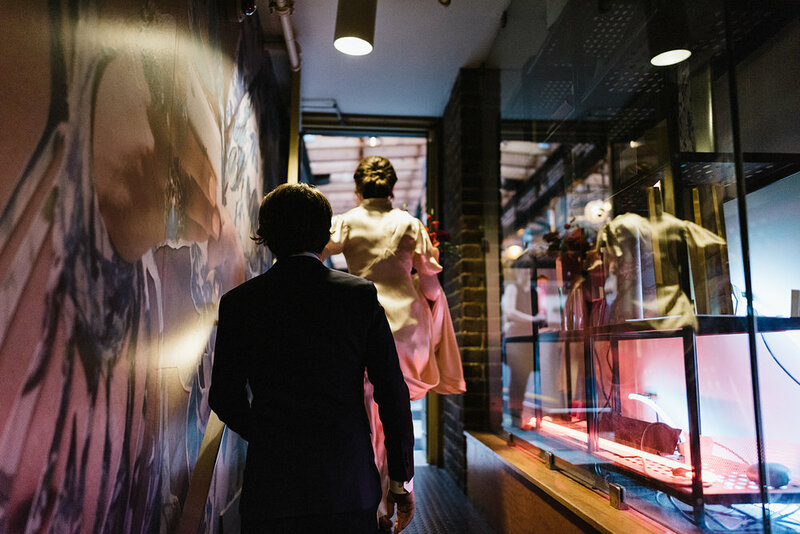 I was caught in a weird moment in-between nostalgia and surrealism, as an ice-cream truck slowly began to approach the barn, I was able to capture that moment and feeling that resonated “Stranger Things” vibes and offered up a weird and cool moment in the wedding day. Of course, with the addition of the ice-cream truck, the bride and groom couldn’t neglect to have street-meat on offer, as there were gourmet hot-dogs for the late-night munchies from all the partying and dancing that was had, effectively tackling the usual midnight munchies problem through and through. 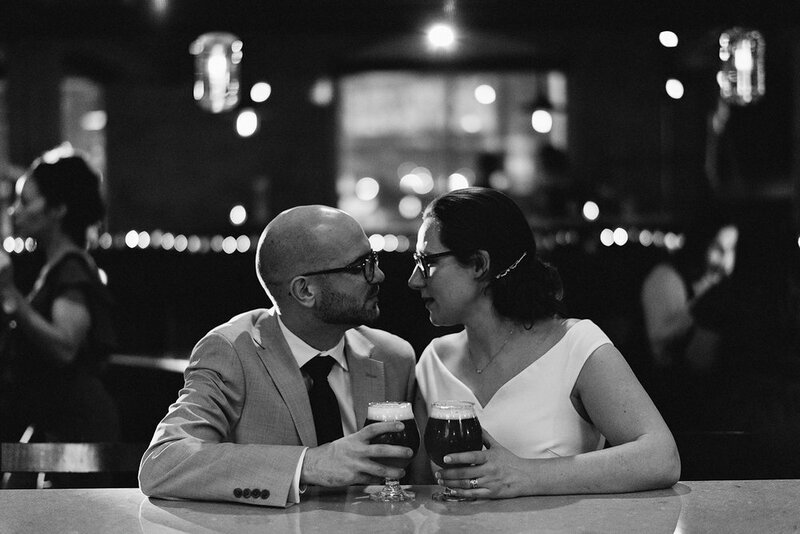 Beneath the moon and stars above Dowswell Barn, the bride and groom indulged and shared a blue slurpee with one another before we took some night time portraits to cap off the already incredible wedding day. 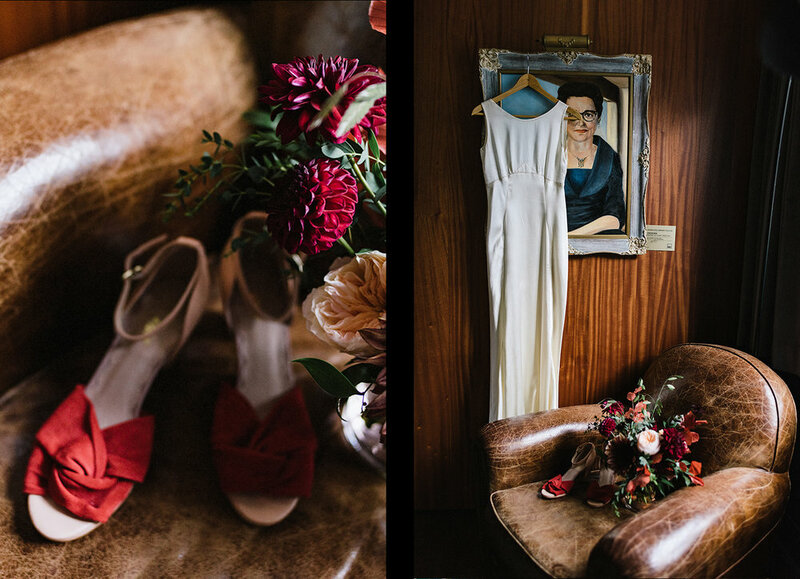 An authentic wedding with vintage aesthetic and vibes, only to be surpassed by the authentic presence of love and family. An unforgettable day and evening at Dowswell Farm with a beautiful bride, a down-to-earth groom, and their adorable baby boy.